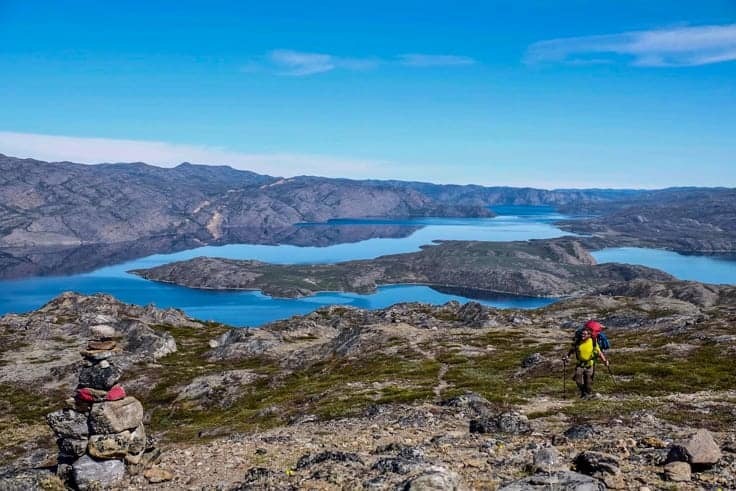 On the west coast of Greenland, the world´s biggest island is one the greatest hikes in the world, the 164km/102mile long Arctic Circle Trail a hike from the tiny settlement and home to Greenland’s only international airport Kangerlussuaq to Greenland´s second biggest city Sisimut on the west coast. 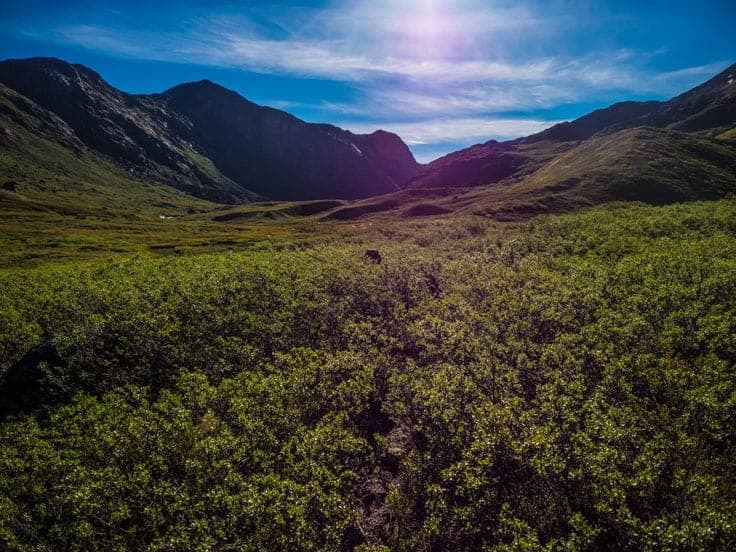 You will need to be completely self-sufficient and carry all your food and camping gear along with you, and the change of getting a fast rescue here is nonexisting if you would be unlucky to have an accident along the trail. While the hike is through complete, pristine wilderness, is things changing fast here. Back in 2015 was the numbers of hikers completing the trail roughly about 300! Hikers a year. In 2017 has the number risen to almost 2000. The trail is pretty well market for most of the time, except for some parts on day 6 and 7. 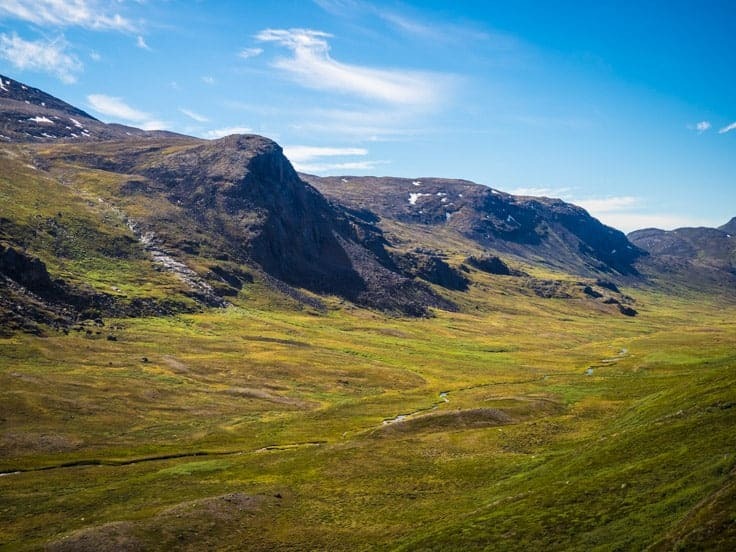 On the nine days I used to hike from Kangerlussuaq to Sisimut on the west coast, did I meet at least six other hikers every day. 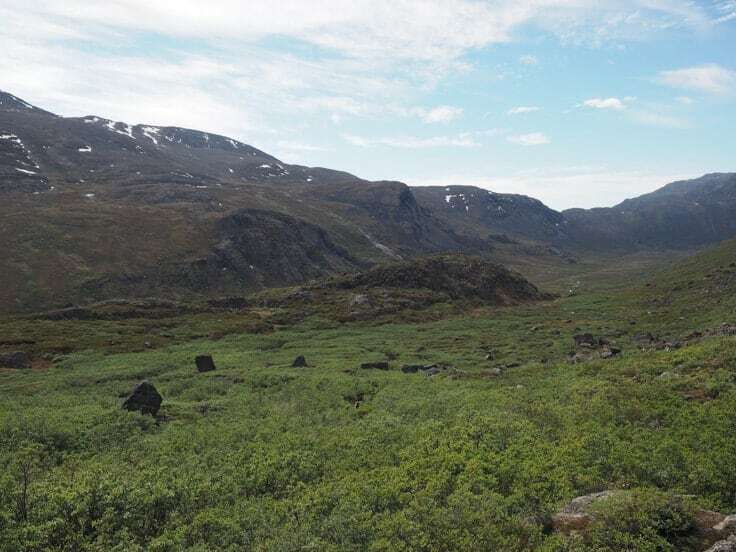 And there are even big plans of building an ATV road now between Kangerlussuaq and Sisimut. 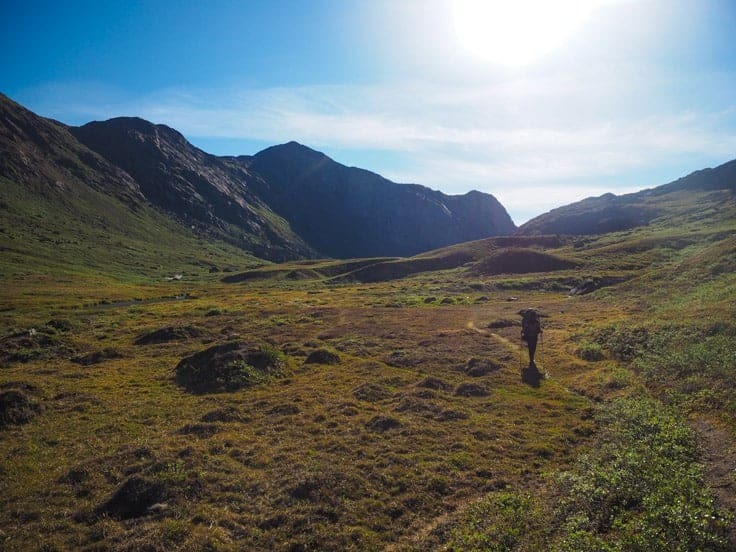 So Unfurtuently if your dreaming of a complete solitude trek all alone in the wilderness, so is the Arctic Circle Trail, not the right hike anymore. And with big numbers of hikers increasing, comes a big amount of garbage along the trail too. All Information here is from when I completed the hike in 9days in July 2017. 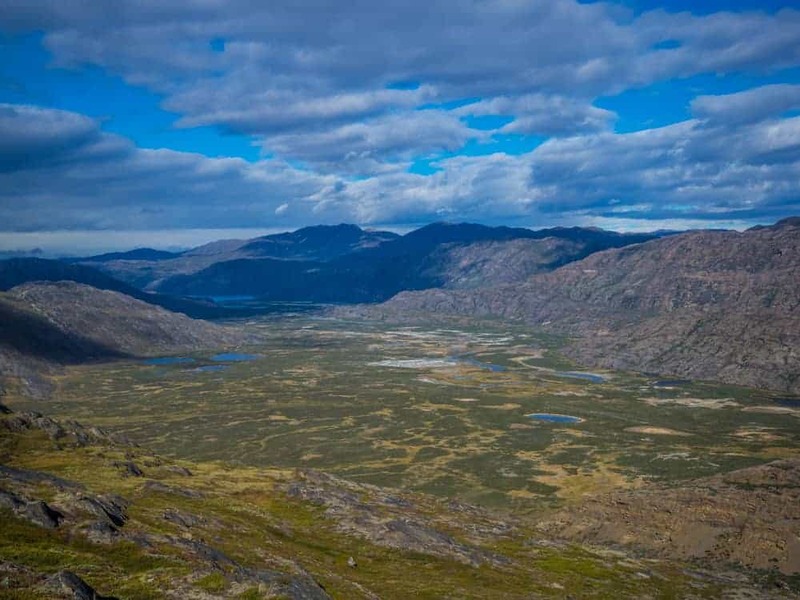 The Hike Officially Starts about 20km west of Kangerlussuaq, from Kellyville a settlement with a population of 11!. 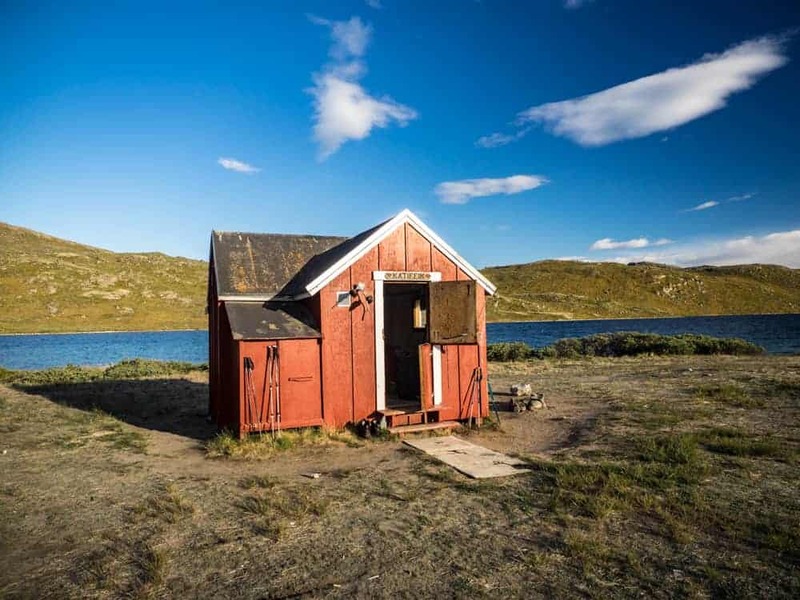 Most people spend a day in Kangerlussuaq (and so did I, Click here to read this post about what to do there) to do the final preparation and to buy the last food and cooking supplies. This is the last and only place to buy anything before your finished your hike. NB. Be 100% sure you bought the right cooking gas for your stove. I meet seven hikers that had bought the wrong type of gas and was eating cold food for their entire hike. And reading in the guestbooks at the cabins on the hike so is this a pervasive mistake. 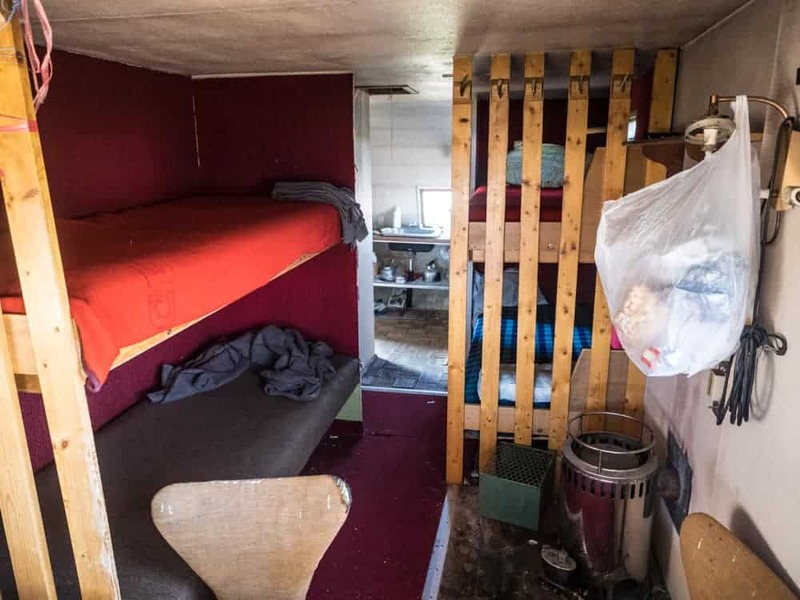 There are nine Offical Cabins and one unofficial cabin on the trail that you are free to stay in, most of them are tinny with only space for 4people, while 2 of them are much bigger and space for big groups. All distances in the post are measured with my Garmin GPSMAP 64, That I carried with me. Day 1. 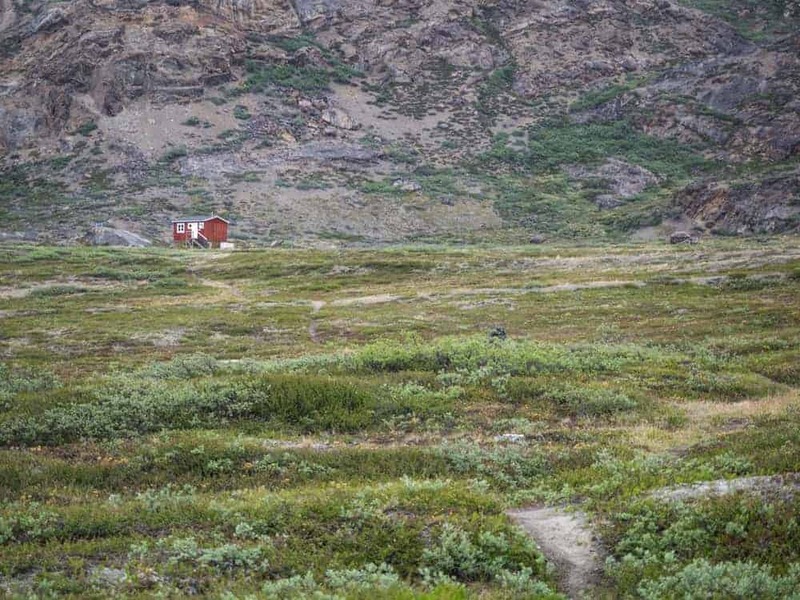 Kangerlussuaq – Hundesø Old Hunting Cabin. I left Kangerlussuaq around 5 PM, just after getting back from the day trip to the Greenlandic Ice sheet. Being already late in the afternoon, so did I deiced to call the one and only Taxi in Kangerlussuaq to take me to the official starting point of the hike just after Kellyville. While I had miserable wheater during the day trip to the ice sheet, so was the wheater getting horrible during the 20min taxi ride to the starting point. The Taxi cost 330Danish Kr by the taxi meter. The beginning of the trail, horrible wheater. 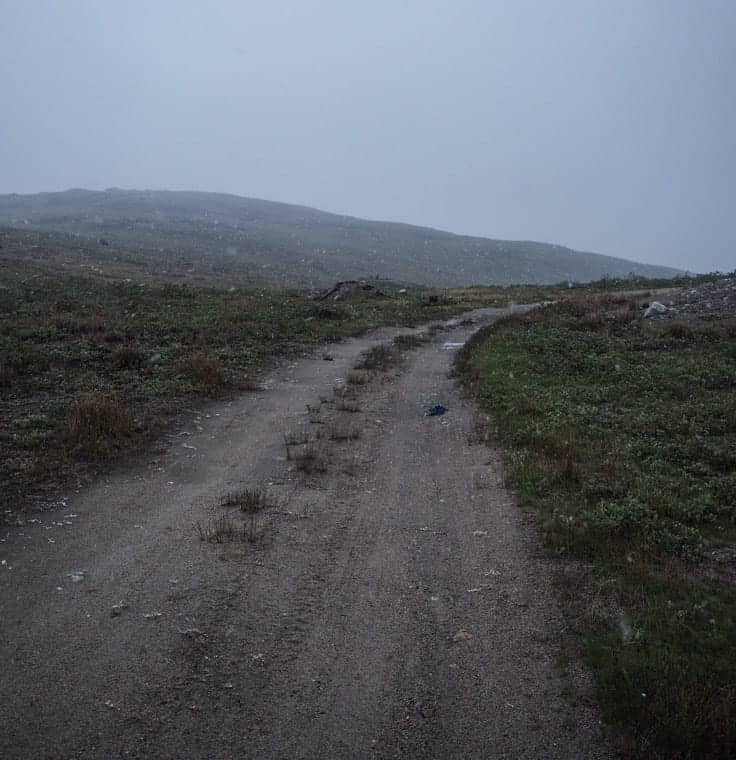 The wheater was getting so bad, so I was considering calling of the taxi and rather stay another night in the warm room I had in Kangerlussuaq or just pitch my tent as soon as I got out of the cab. The wheater was getting worse, and the thermometer inside the taxi was showing a freezing -5 C/23 F with snow and wind when I left the cab. In the end, did I tell myself, to stop bitching and just walk to 5Km to the old hunting cabin of Hundesø Hunting Cabin. The hike from the starting point of the trail to Hundesø is mostly along an old wet ATV road used by local hunters. There are trail marks along the whole path, red marks on stones. But the visibility was that bad from the wheater so I couldn’t see far enough to spot the marking. I just had to follow the ATV road. Hundesø Hunting Cabin in the late evening. I reached the hunting cabin, thoroughly wet and cold after two hours. When arriving there did I notice that the cabin was occupied by some fellow hikers that were also seeking shelter from the lousy wheater. I jumped into the last bed in the addicted while listening to the wind and feeling the cabin shaking; I soon passed out. Waking up early the next morning to bright sun, I cooked myself a hot cup of coffee and climbed the small hill next to the cabin to enjoy some strong sun in my face while warming up from the hot coffee I soon realised that the cabin is located almost next to a lake, but from the snow blizzard the night before was I unable to see it, or to be correct I didn’t see anything except snow yesterday. 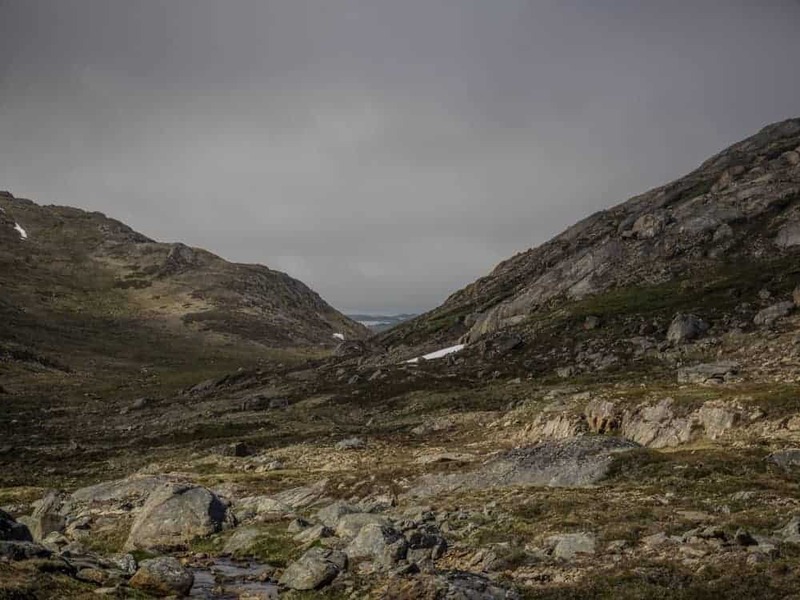 What had yesterday been a miserable day with minus degrees and snow proved to actually be a blessing, I didn’t see ANY of the notorious Greenland Mosquitos on my first two days of hiking. Typical Scenery on the second day. 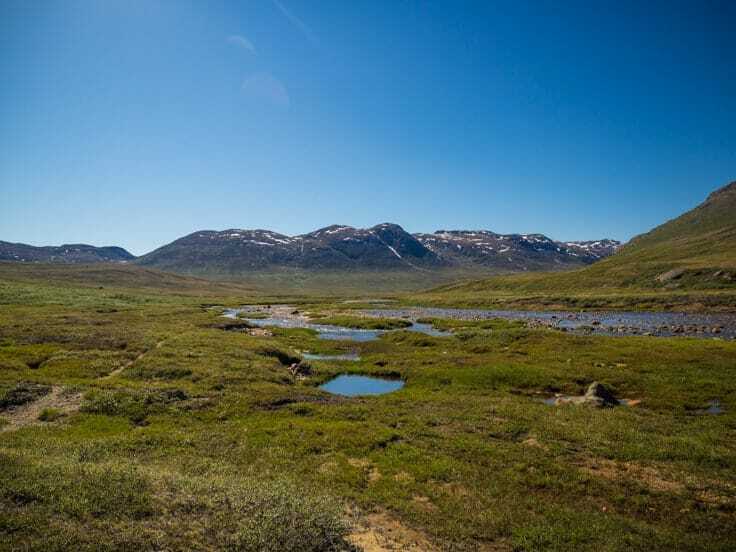 The hike from Hundesø to Katiffik is one of the most beautiful on the whole Arctic Circle Hike. While it´s it’s not a difficult day, so is a bit up and down on rocky and very very west parts on this day, so it´s hard to keep up a fast phase from all the bouldering parts. While “Expert Vagabond” did mention that he came across a lot of wild berries for eating during his hike, so didn’t I find any berries at all during my hike. Not a single one. Day 2 is also one of the easier days on the entire hike, with a few climbs, non that´s very steep but parts of this day is across one of the higher parts of the hike, this part was very windy. 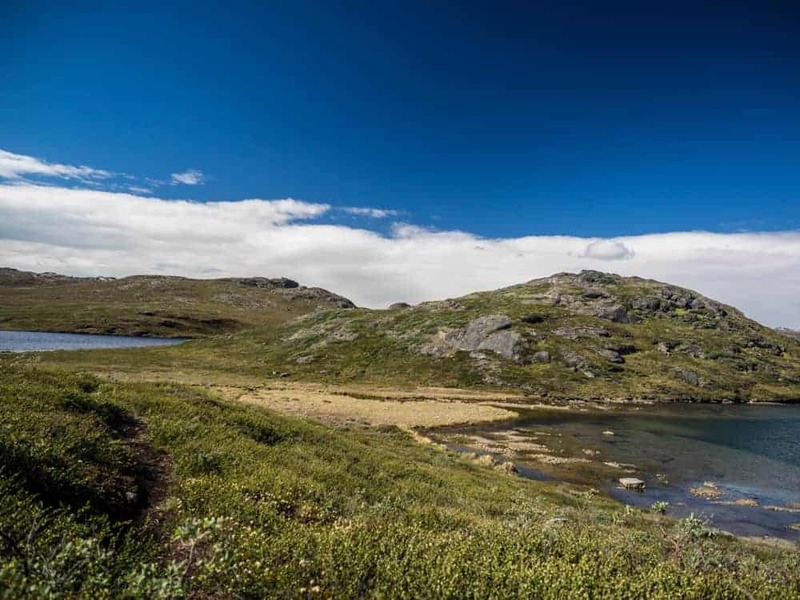 The last part is downhill for around 30minitues before you reach Katiffik cabin that´s located right next to Lake Amitsorsuaq. 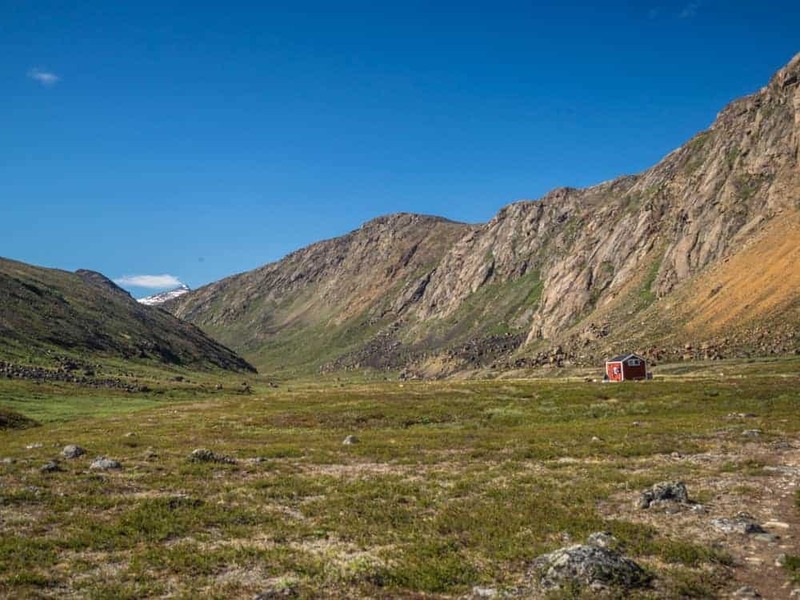 Katiffik Cabin in front of Lake Amitsorsuaq, notice the four pairs of walking sticks outside the cabin. Crowded. 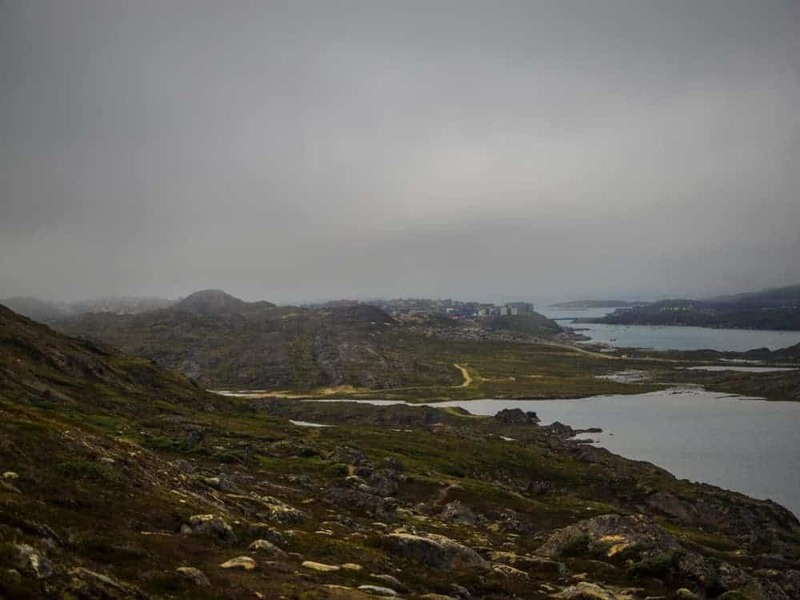 This is where you will be able to pick up one of the “famous” canons if your lucky and paddle the next day to the Amitsorsuaq Canoe Center instead of walking. If you got some extra energy so is there a sweet camp spot in another 2hours easy hike from Katiffik, but there are not many flat parts to pitch your tent before that, so if you decide to continue walking, you will have to walk the two hours. Day 3. 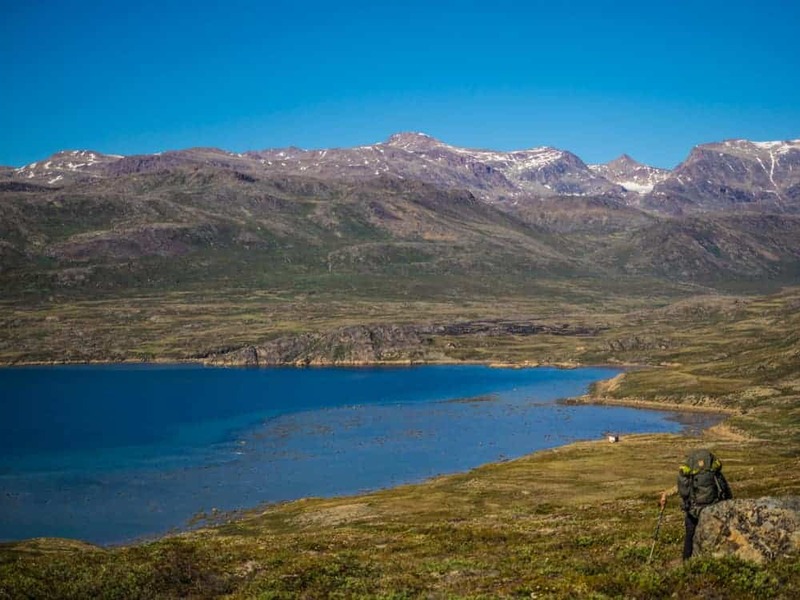 Katiffik Cabin – Amitsorsuaq Canoe Center 20KM (12.5miles) 6hours. 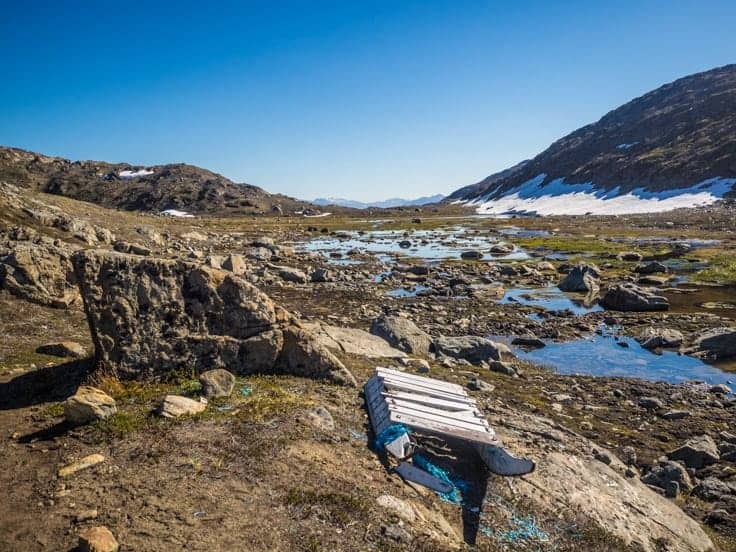 If you are extremely lucky will you be able to use one (the last) of the old canoes that are left behind at there shores at Katifikk cabin and paddle the 22km (14miles). But don´t keep your hopes up, There were no canoes around Katiffik cabin during my hike, I found all of them later smashed up and almost completely broken down on the other side of the lake. 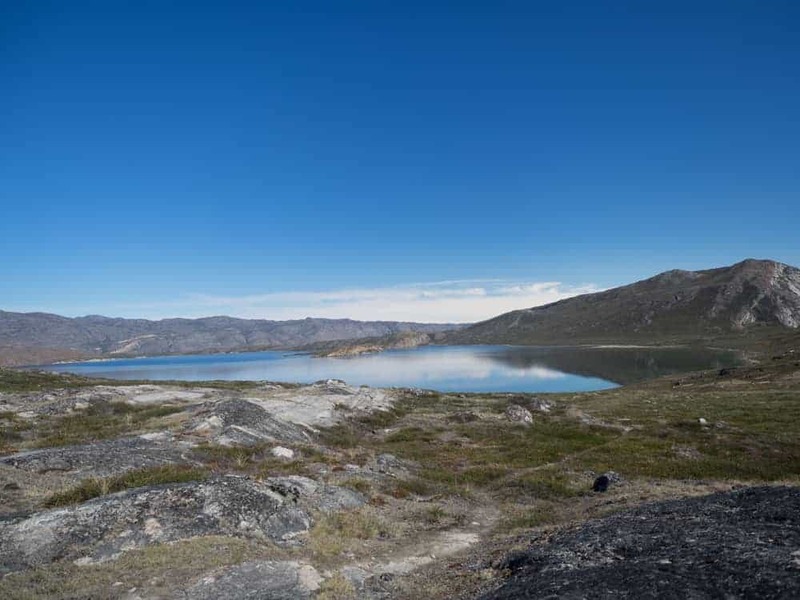 So the days where you can paddle across Lake Amitsorsuaq lake seems to be gone now. 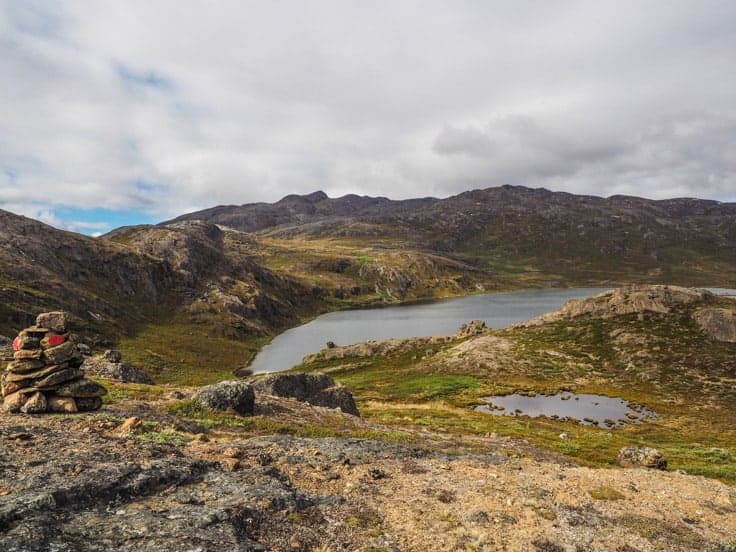 The whole day today is along the western shores of Lake Amitsorsuaq, another beautiful and easy day, there´s a few ups and down but nothing that I would call a climb. The beach that would be a good camping spot. 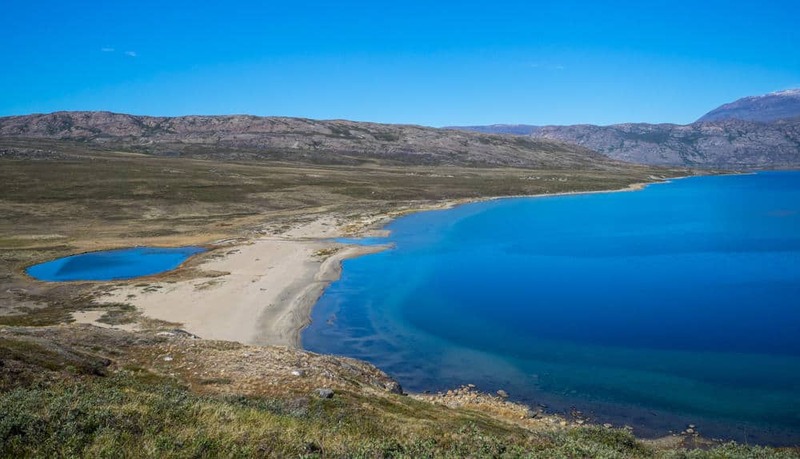 The place to stay today if you don´t want to camp is the Amitsoruaq Canoe Center. An old failed business idea that´s no one of the huts along the trail. The canoe center is by far the biggest hut on the trail with bed space for 22! people and floor space for tons of more people, two indoor (outdoor) toilets, two big tables, and a cooking area. While reading through the guestbook, I learned that a week before I had been there 34 people had stayed at the canoe center at the same time. During my stay where we 8 people sleeping here this night. Day 4. 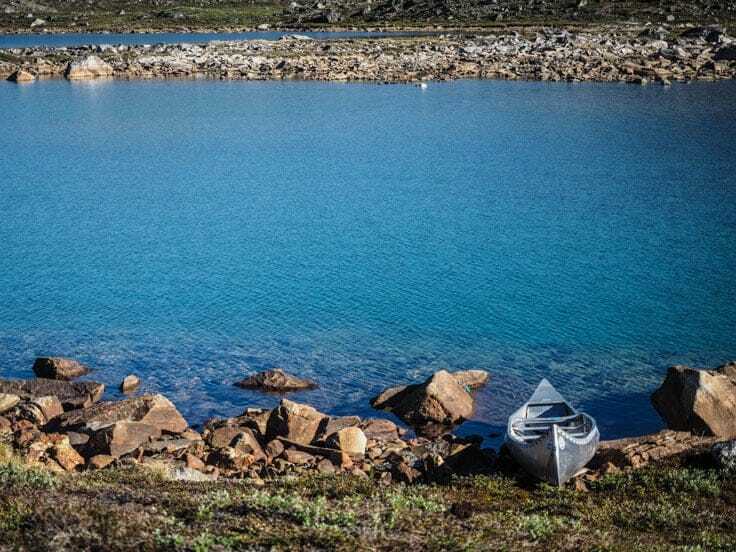 Canoe Center – Ikkattooq Hut 24KM (14.9miles) 10hours. Maybe the hardest day. Not only from the climbing but also from the lack of water but also the mosquitos where back. After a nice sleep in the padded beds in the canoe center was it time to set off before 7 am after enjoying my breakfast inside together with the seven other hikers. The day starts off easy and mostly flat before you reach the last resting place for the canoes, and it´s easy to see why there were no canoes the previous day at Katiffik Cabin. Nine canoes are laying smashed up around here, most of them with huge holes in, some of them someone tried to fix with ducktape. But Only 1 of the canoes seems to in “good” enough shape to be used paddle across the lake with. Just after the canoe graveyard will you enter a vast wet area, where you gone be lucky not to get wet. 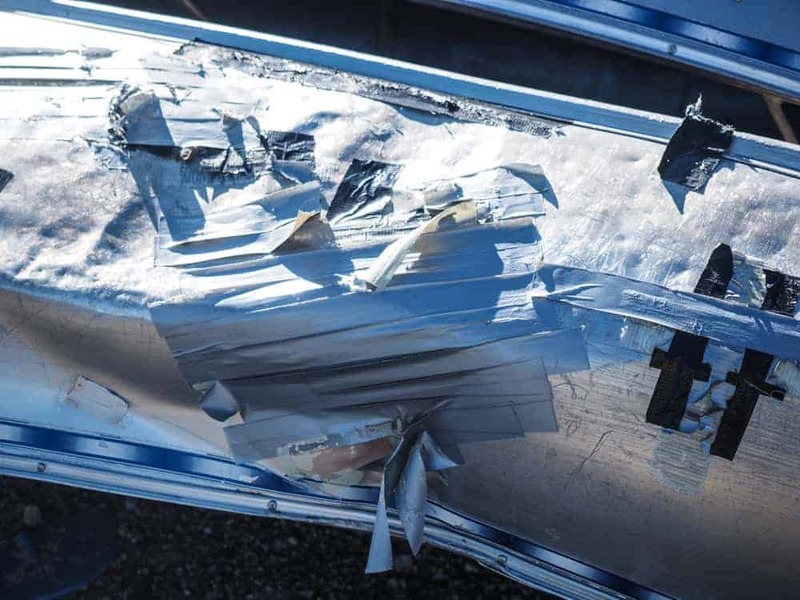 This is how most canoes look like now. 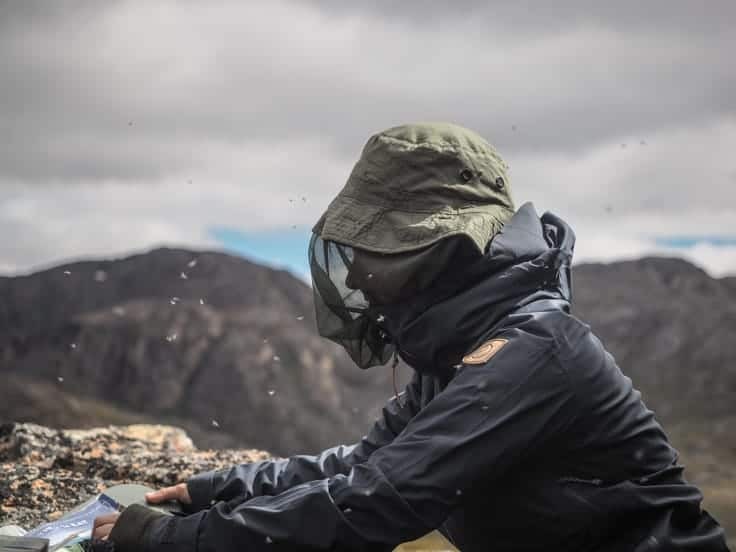 Another thing that was changing today was that the notorious Greenland mosquito was back, after being able to walk without them for the two first day’s because of the cold of the first day, so was today the day where I would really understand how lucky I had been for the two first days. It was a mosquito HELL from now on. 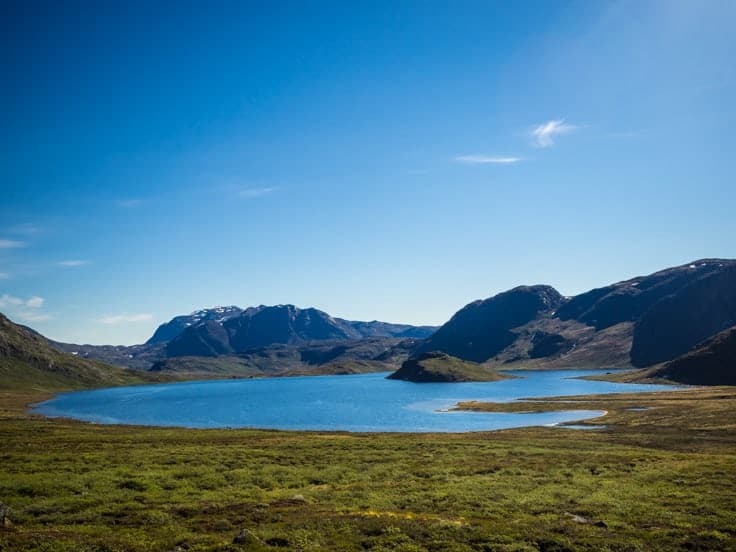 From now on will you head up into the mountains, this is the day where the trail starts to climb, the first climb is only about 30min to the top of a “plateau” that offers a great view over the lakes and trail that lies ahead. The first lake is a great lunch spot. The lake that offers a great resting spot. After the lake is there another long climb that from the top will you get a great view over a pristine white sand beach at the western end of a lake. The “white beach” A good camping spot. This will be your best spot to camp this day if you want to do a short day today. 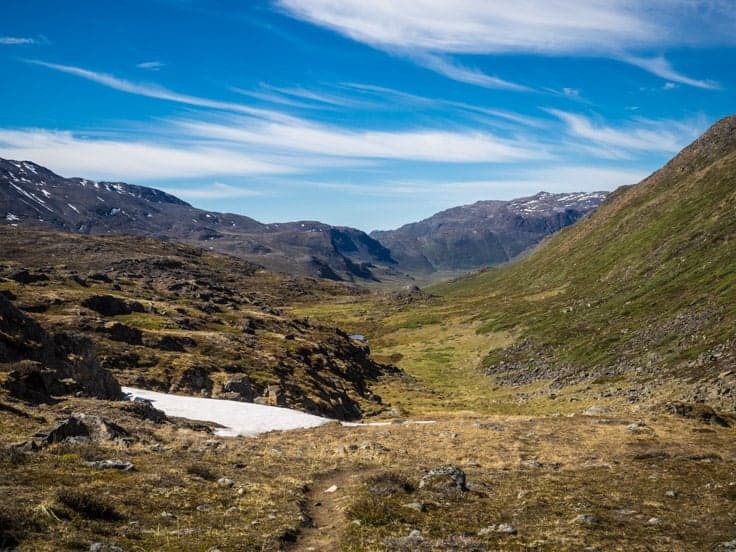 If you decide to continue onwards so will you now head to the steepest and longest climbs on the whole Arctic Circle Trail. Be in mind there´s now where to get water during before your done with all the climbing now. So be sure to fill up your water bottles here. I didn’t know this, so I was out of water during the hardest part of the whole hike. A few hours of uphill and two seriously steep rocky climbs lay ahead, starting just after the beach. After close to two hours of climbing, will you get to the top where again you will get a fantastic view of a few lakes in the area. My hiking body trying to prepare a meal, notice the mosquitos. 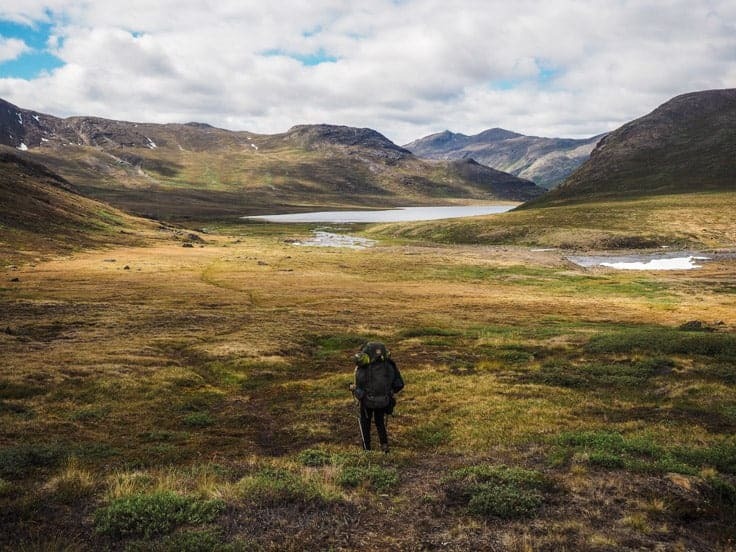 It´s impossible to enjoy the Arctic Circle Trail without a mosquito hat. Just to sure to get one with not the smallest “holes”. 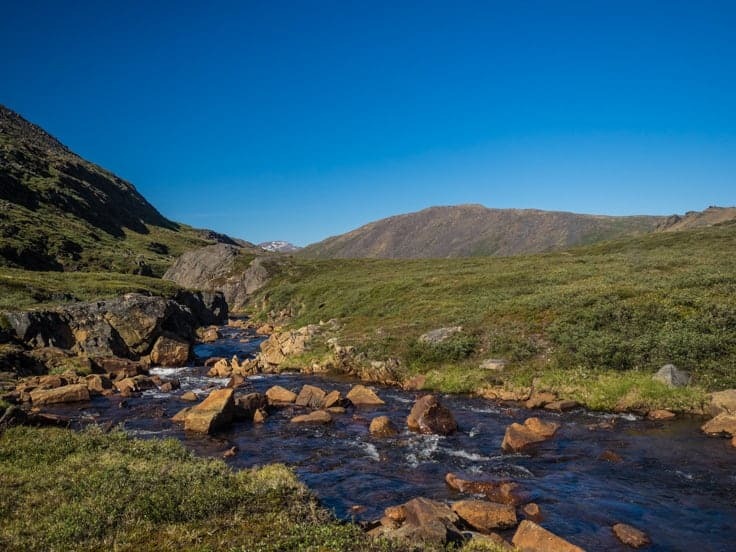 If you think about having a rest, just forget about it, this area was the single most mosquito infected area on the whole Arctic Circle Trail. Just stopping for a few seconds for a few seconds to catch my breath would result in having uncountable numbers a mosquitos flying around me. You won’t really get time to rest before reaching Ikkattooq Hut about two hours after you reach the top, the good news from here on is it mostly flat and smooth. When reaching the hut will you notice that everything in this area is burned, There was a huge wildfire here at the end of August 2016. 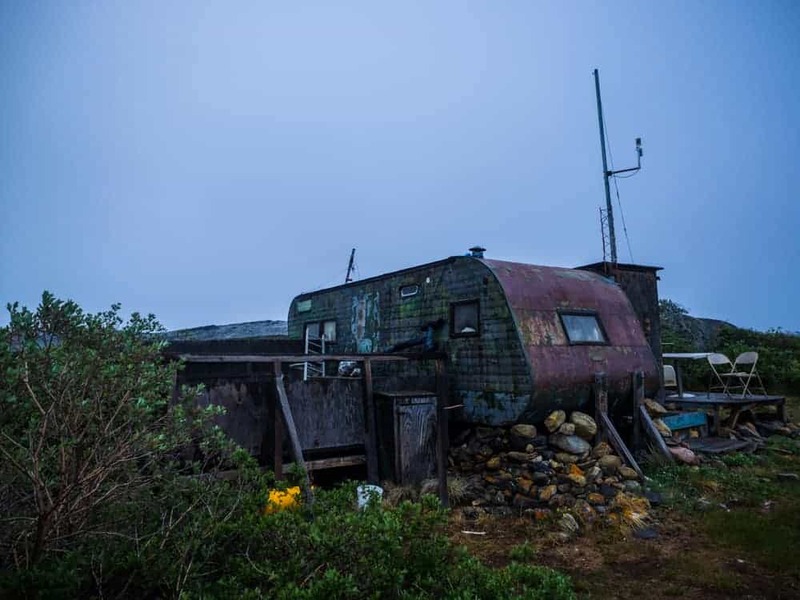 There´s a wonder that Ikkattooq Hut didn’t get caught by fire, everything around it is burned. The fire started after some hikers supposedly tried to burn some of their garbage, the wind caught fire and spread it. The whole area is burned off, but the Ikkattooq Hut is still standing, this is where you will sleep this night, there was impossible to camp here from the number of mosquitos. Day 5. 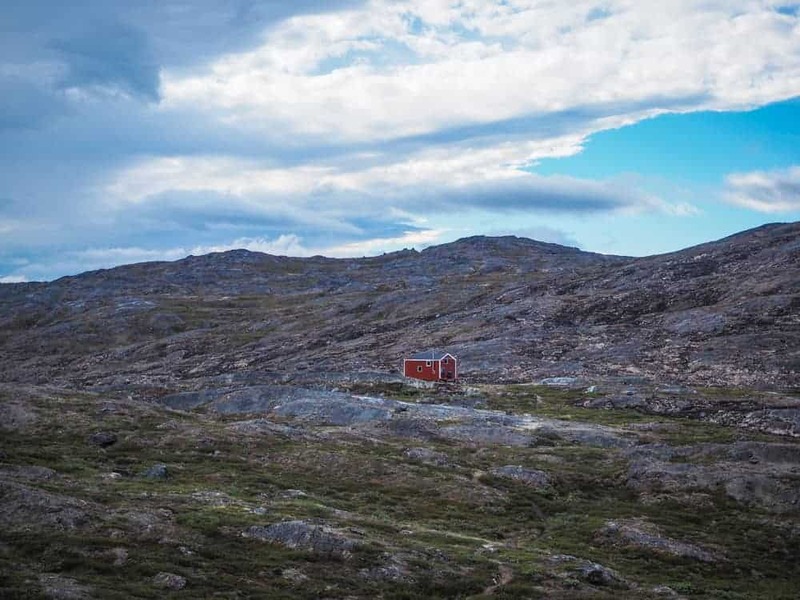 Ikkattooq Hut – Eqalugaarniarfik Hut 12KM (7.4miles). 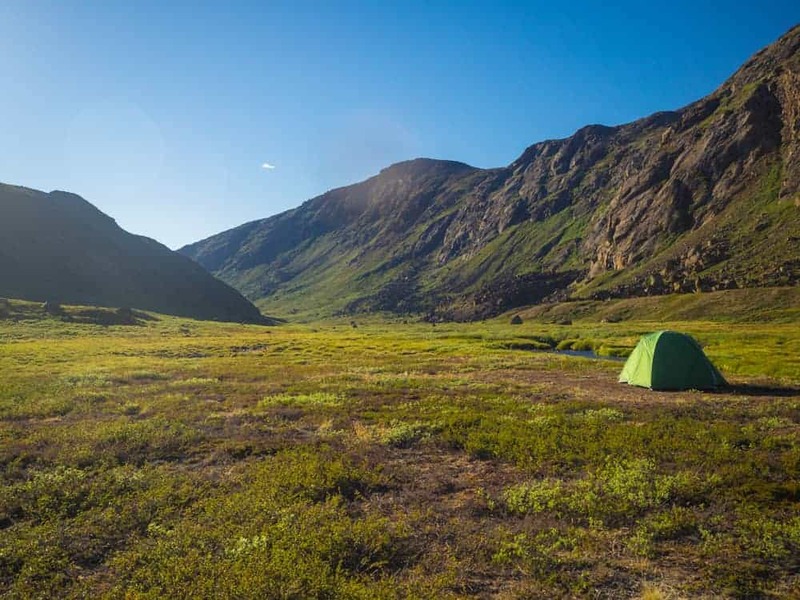 After a great night sleep in a crowded cabin, 5 other hikers slept at Ikkattooq Huq this night, was it time to have an early morning start at 6 am. this day starts almost immediately off with a few steep climbs that are done in no time before you reach the top an stunning view over the whole valley that lies ahead. 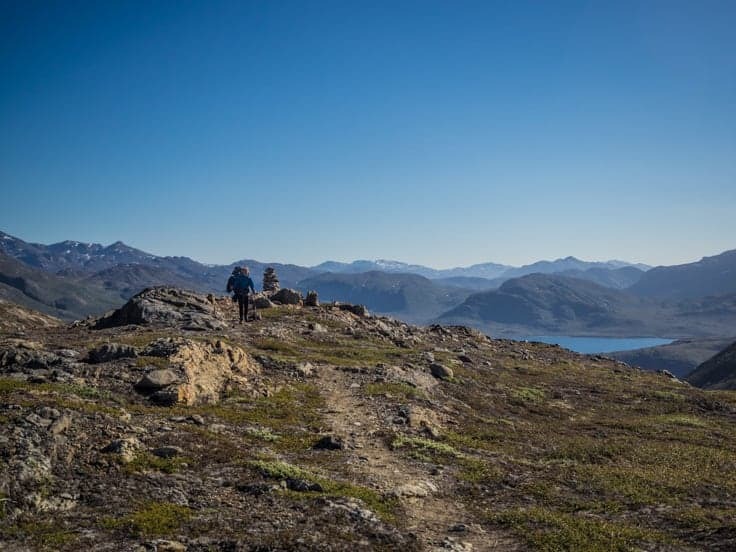 Maybe the best view on the whole Arctic Circle Trail. A great place to stop for a snack and fast bite. What comes up, has to come down, and for you that´s today. All the up hilling you did yesterday and the morning today is it now the time to get down to the valley floor. 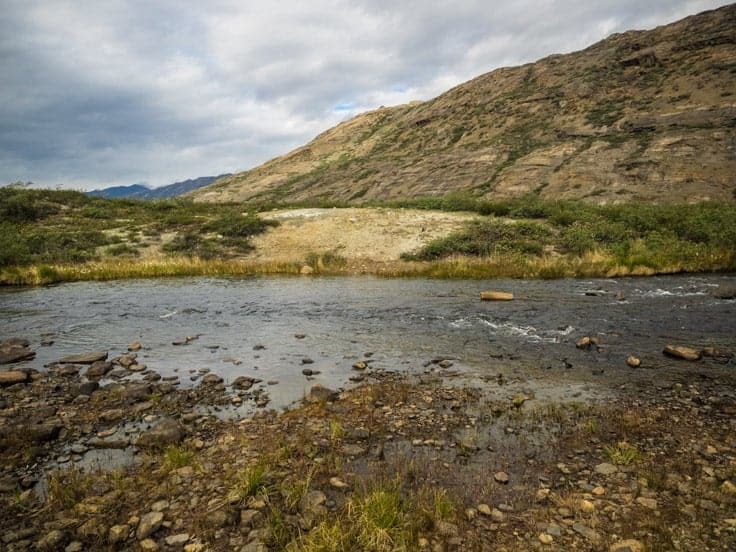 The valley floor is almost entirely flat and smooth to walk across, but significant parts are completely wet, follow the sign, and you will reach the “famous river” that you will have to cross. The crossing is not where you meet the river the first, but another 100meters or so further up against the stream. Where you will cross the river. Look for the remains of a big old bonfire across the river, this is where you will cross. If you got walking sticks I highly recommend you to use them here or look for something you can use as a walking stick, the current is strong. Me doing the “famous” river crossing, the water is actually not as deep, but it´s freezing cold. If you brought some fishing equipment with you, so is this the place to fish. A friendly solo Australian hiker I meet during the hike, caught no more than 7! huge salmons at this spot. He came by Eqalugaarniarfik Hut in the evening and gave me and the five other hikers that stayed there, a freshly caught salmon that ended up as a delicious bbq. An amazing change from the vacuum packed hiker food. Thank you, Kain! 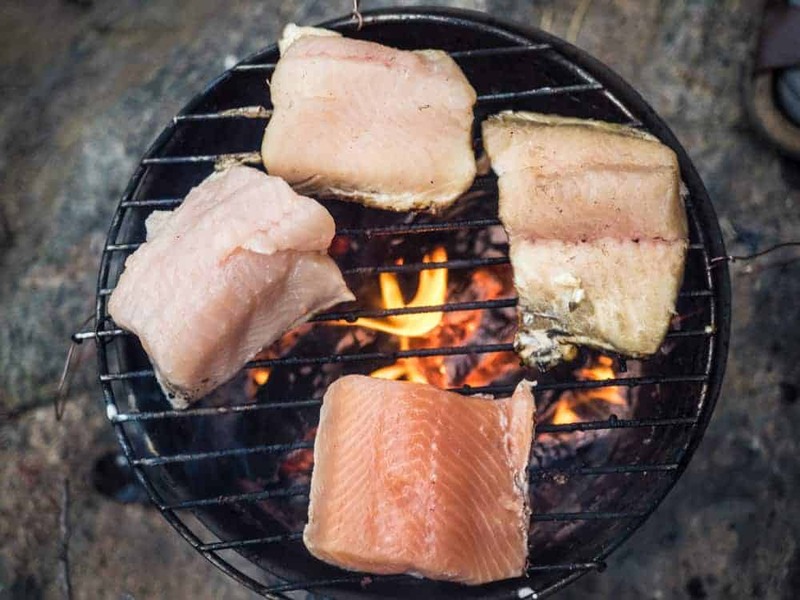 Freshly bbq Salmon, freshly caught by the river crossing. From the river crossing is the hike mostly wholly flat for the next hour or so, but again very wet, for the next hour or so before you got about 1hour uphill in the end to you reach Eqalugaarniarfik Hut. PS. You will see a wooden sign off the path to the right that seems misplaced. Just ignore it. Just follow the path. And eventually, you reach Eqalugaarniarfik Hut. 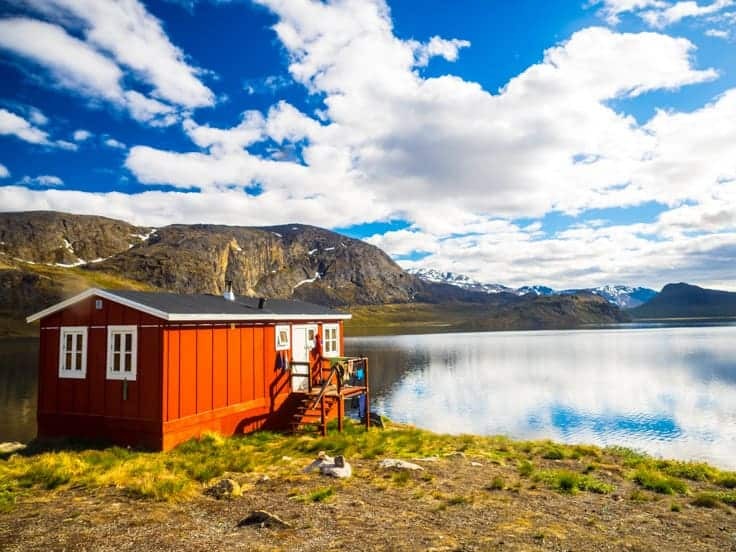 It´s one of the coziest huts on the whole Arctic Circle Trail. 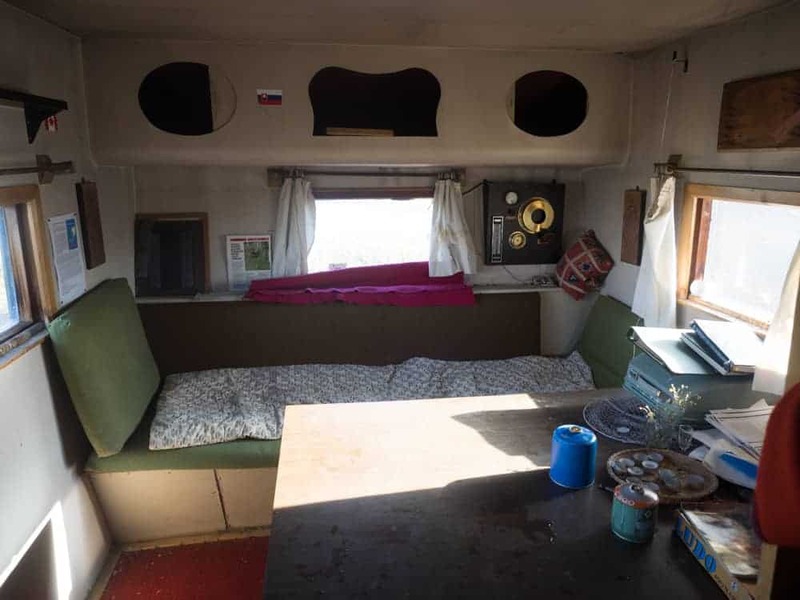 With a sleeping space for four. But there´s enough space for another four people on the floor here. We where six people inside (i slept on the floor). There´s also an indoor (outdoor) toilet here. This was probably my second favorite cabin on the whole trek, after the lake house that I would sleep on the following day. Day 6. 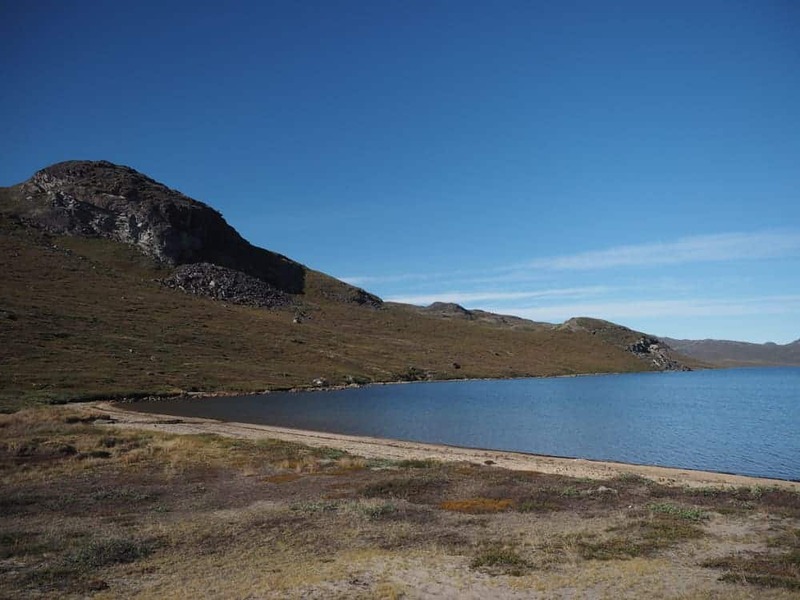 Eqalugaarniarfik Hut – Innajuattoq hut (Lake house) 20KM (12,4 miles) 8hours. 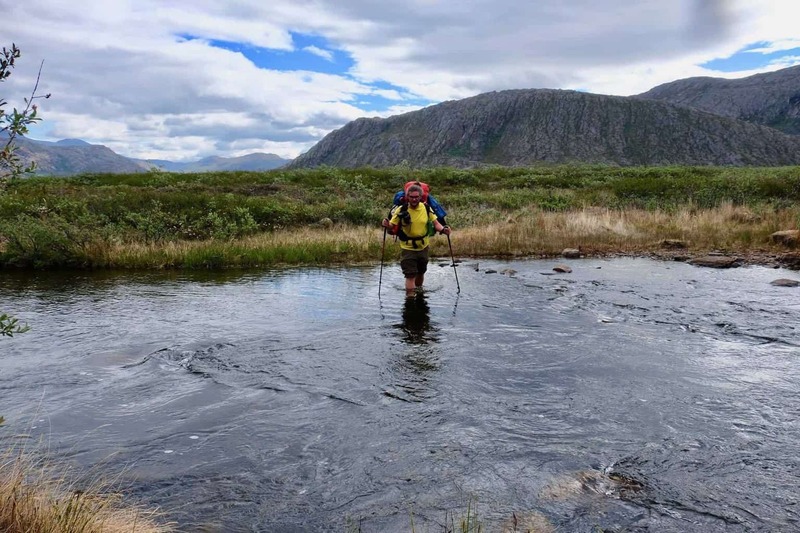 A long and very wet day trough flooded marshland, but at the end of the day, you get to stay at the most beautiful cabin on the Arctic Circle Trail. 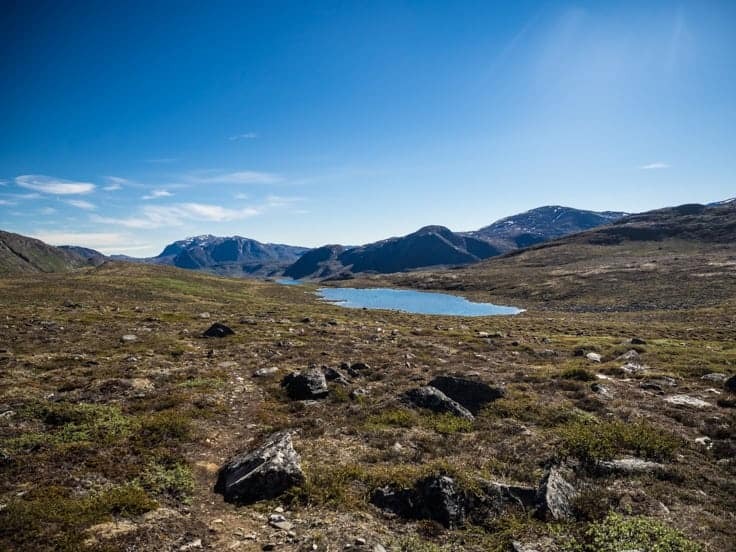 This day starts off with a climb immediately after you leave Eqalugaarniarfik Hut be sure to refill your water bottles before the climb starts. There´s not anywhere to refill your bottles before your heading downhill again after a few hours. Looking back towards Eqalugaarniarfik Hut can you see it? While the beginning of the hike today is mostly mosquito free, at least at the higher parts on the beginning of the hike, so are the parts when you descent down to the lakes again a mosquito nightmare once again. 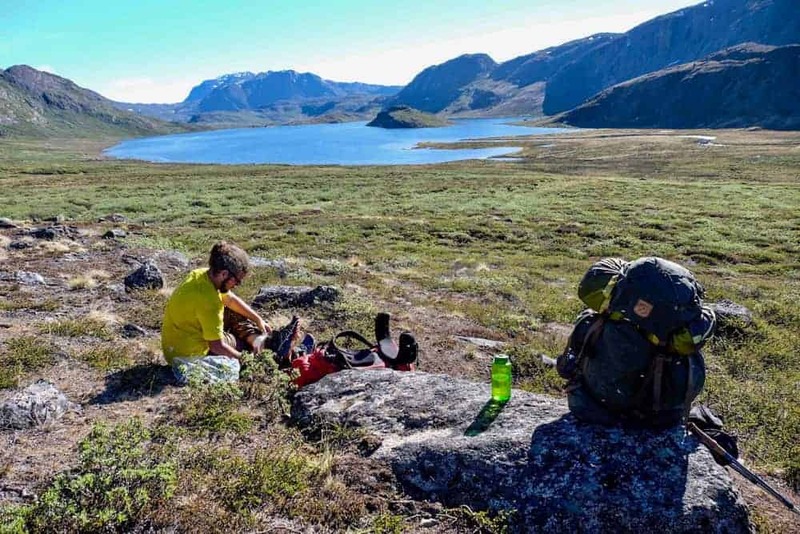 When I was enjoying my lunch after some hours, did I meet two Danish hikers that were running the entire Arctic Circle Trail in just three days. 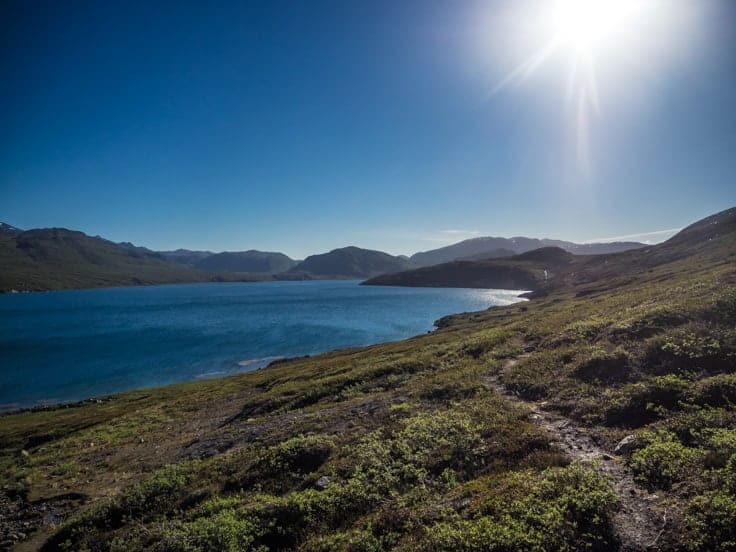 First-day Sisiumt to Lake House, Day two Lake House to the Canoe center, day three canoe center to Kangerlussuaq. And the strange thing I meet a local woman a bit later the same day was doing the same thing. Time to head down again. Today you will have problems with finding the path for a big part of the day; it goes through a marsh Land Bog Swamp area, where I ended up having water to my knees a few times. While you can see across the whole area and it doesn’t seem to be that far, so is this part really hard physiological you don´t just battle your way through the marshland in the knee-deep water, you also have to fight a billion of mosquitos every time you stop. For me, this was by far the hardest day physiological. My hiking friend. It might not look wet, but the whole area from now on to the end of the lake is wet marshland. But in the end, it´s all worth it when you reach the Lake House. Be in mind there are two cabins today, you will reach the first one about 30min after the marshland, but this is not where you want to stay. You want to continue for another 30min to you reach the lake house. Just be in mind that you can not see the Lake House before your literally at its doorsteps. My hiking body just realized we reach the lake house. 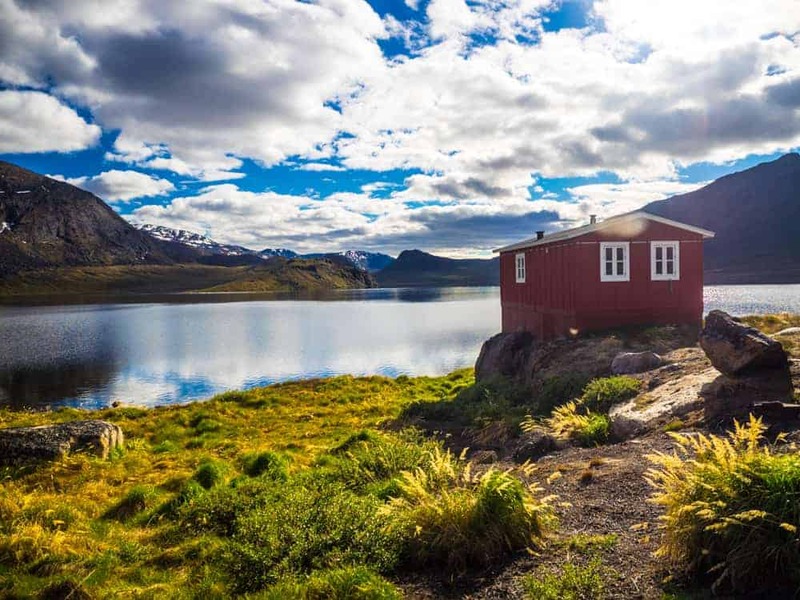 Lake House, by far the most beautiful cabin on the Arctic Circle Trail. The lake house from the other side. Inside the lake house, we where eight people were sleeping here this night. If you decide to have a rest day so is this the place. There´s a shallow beach right next to the cabin, where you can take a very refreshing and cold bath. Lake House has bed space for 10 people, a small kitchen area, and an indoor (outdoor) toilet. But as everywhere else as the last few days so where there way to many mosquitos to being able to enjoy the outdoors here. Day 7. 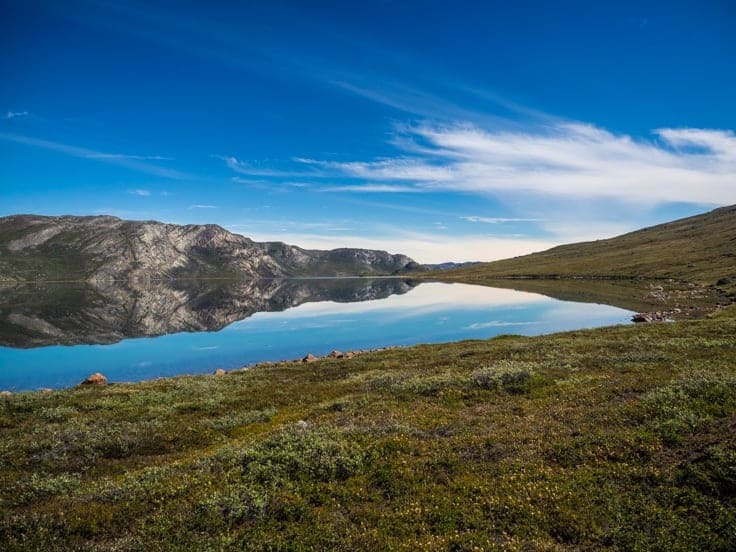 Innajuattoq hut (Lake house) – Nerumaq 17KM (10.5 miles) 6Hours. If your using a Garmin GPS, with a TOPO Greenland map, so is the map way of today, it´s utterly useless today. I and my friend leaving the lake house. The day starts off nice and flat for the first hour or so through a thick bush vegetation. But it´s really easy to lose the trail here. I and my hiking body lost it at least 6 times. But just head straight and eventually you find the trail when the terrain starts to climb again. The hike to today is pretty easy with all the climbs being done after the few first hours. Looking Back towards the Lakehouse from the top of the first climb, if you look closely will you spot it the back. Having a rest and checking my blisters. The biggest difficulty today is actually to find the path at some points. Most of the climbs today is rocky, but not to difficult, at least not compared to what you already experienced in the previous days. And then down again. Notice the snow. At the end of the photo so is there two trails, one upper and one lower. Its badly market here. The lower part is wetter but a lot easier since it´s almost completely flat. The upper path offers a stunning view of the valley, but the path completely disappear for some time, and you have to navigate through a wall of bushes. To sum it up, lower path is easier and faster, upper is difficult but offer a great view. I choose the upper path. The view from the upper path. From my resting spot on the top I did see the only wildlife I saw during the whole trip, two reindeers walking along the path at the valley floor. 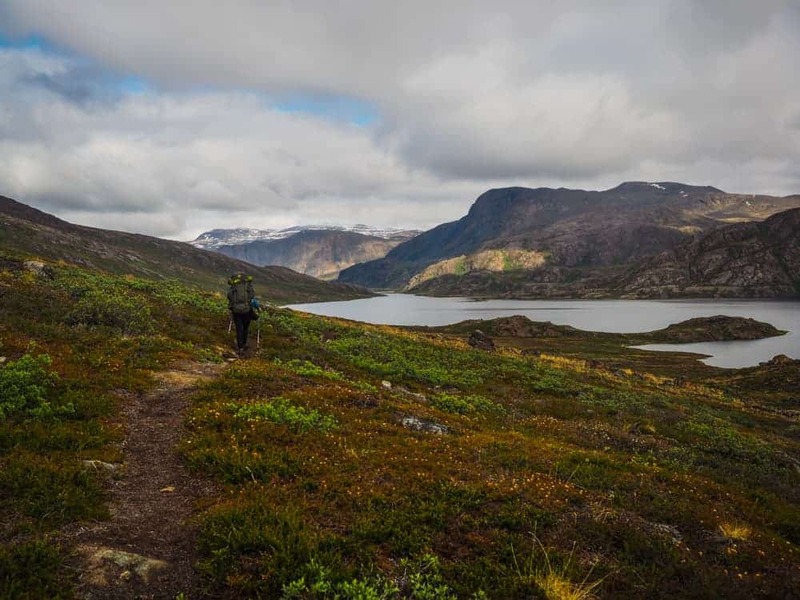 This is one of the most pleasant days on the entire Arctic Circle Trail, you can notice your backpack is getting lighter now, and today´s hike is not as wet as previous today’s, so your feet won´t hate you this evening. It might not look tall, but the bush is just as tall as me so it was a nightmare to navigate trough. Back at the valley floor after battling your way through the wall of bushes is no more than 30/40 minutes to you reach the small Nerumaq cabin. It´s a small cabin with only sleeping space for six. And with all the other hikers that stayed at Lake House Previous night so is there no other option than pitching your tent today. No worries there’s tons of great camping spots in close proximity to the cabin. My camping spot. You can´t see it in the photo, but there´s a river right next to my tent with clean drinking water. Day 8. 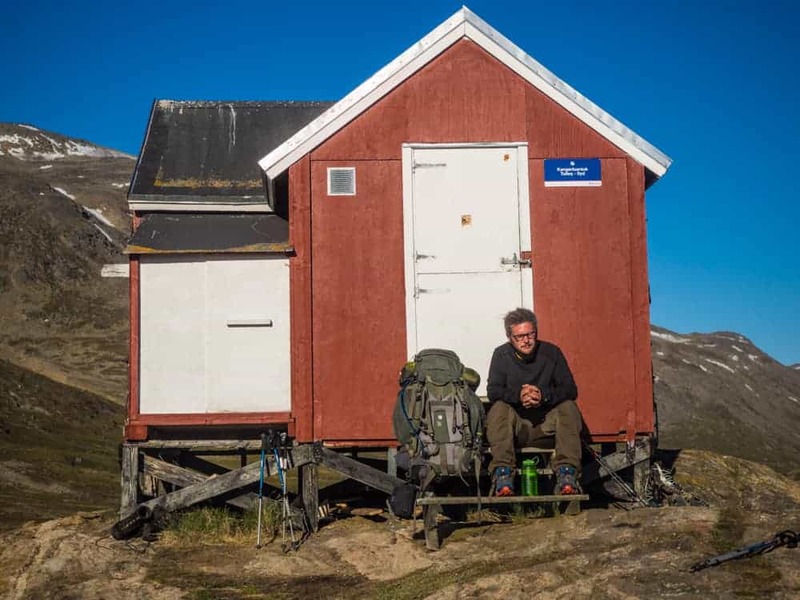 Nerumaq Hut – Kangerluarsuk Tulleq 16KM (9,9miles) 7Hours. 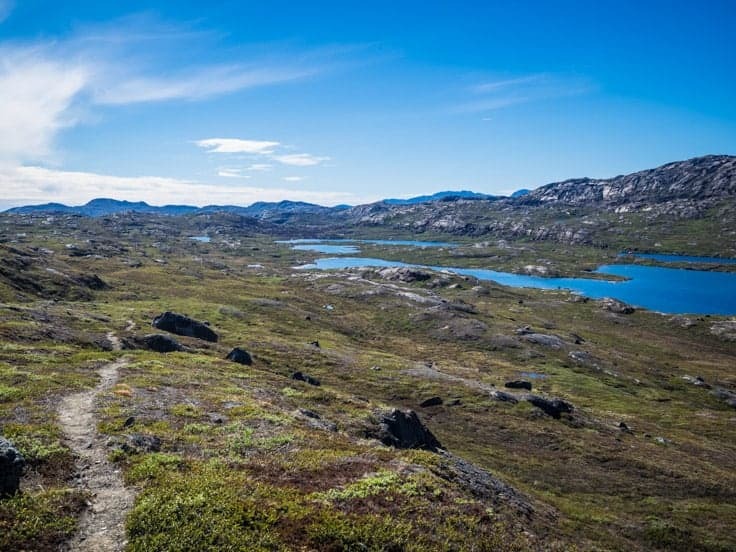 The second last day on the Arctic Circle Trail is a surprisingly hard one. With once again bad trail marking. Two big river crossings, one of them dangerous, and big wet parts again. 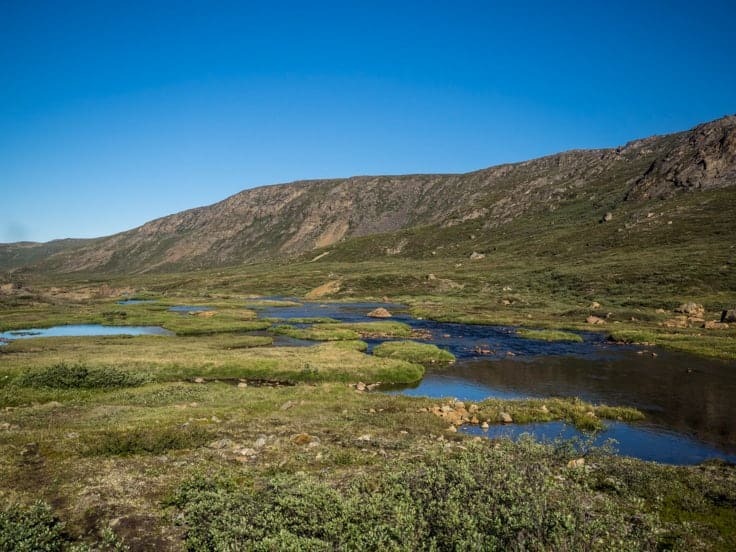 Day 8 starts off nice and flat for the first hour or so, but it doesn’t take long before you once again meet a wall of bushes or dwarf willow trees to be correct, they don´t have any trees in Greenland they said, but these dwarf willow trees can get up to 1.8meters. For the first part of the day it´s just to follow the path along the river, but then suddenly it disappeared, and it took me more than 1 hour to find it at one point. The first and dangerous river crossing is here. You will have to jump from stone to stone at the photo above to cross the river. The path continues straight ahead on the left side of the photo, DON´T follow it. it´s a dead end and you will have to rock climb almost straight up with your heavy backpack to cross the river there. I had to do that, if I had fallen would I most likely broke every bone in my body and with no help close by would this probably have been your last resting place. Have to cross the river on the right side. Also, the second river crossing shortly after is very badly market, and the only way to get across is to take off your shoes and get wet at this point. Luckily after this crossing is the path flat at nice for the next two hours or so with a few great lunch stop spots so you can dry off your wet feet. Having a rest at the top of the last climb of the day, notice the small red cabin ahead an alternative cabin you can stay at. You can also see local houses again from up here. Getting close to finish the hike now. The rest of the day is easy with the last part being very steep uphill. 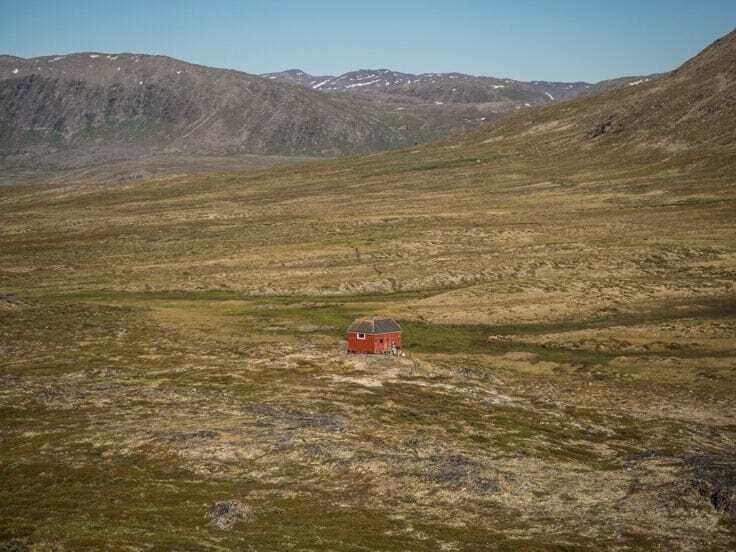 On the top will the trail marking disappear once again, just head straight and you will see Kangerluarsuk Tulleq cabin in the distance, parts of here are really swampy and wet so there´s no way you gone arrive at Kangerluarsuk Tulleq your last cabin on the Arctic circle trail with dry feet. Me having a rest in the sun in front of Kangerluarsuk Tulleq. Day 9. 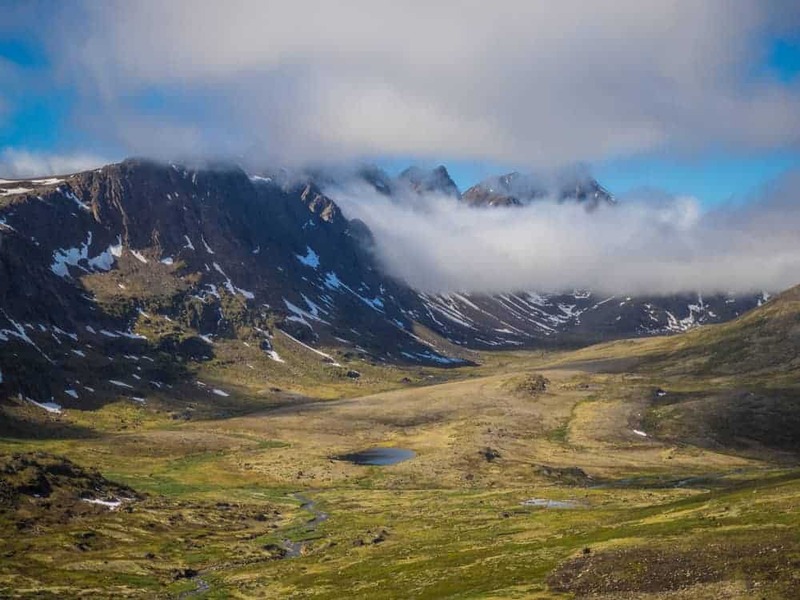 Kangerluarsuk Tulleq – Sisimiut 17KM (10.5Miles) 10 Hours. The last day is far from the easiest, but the first shower in 9days gone be excellent and well worth it. 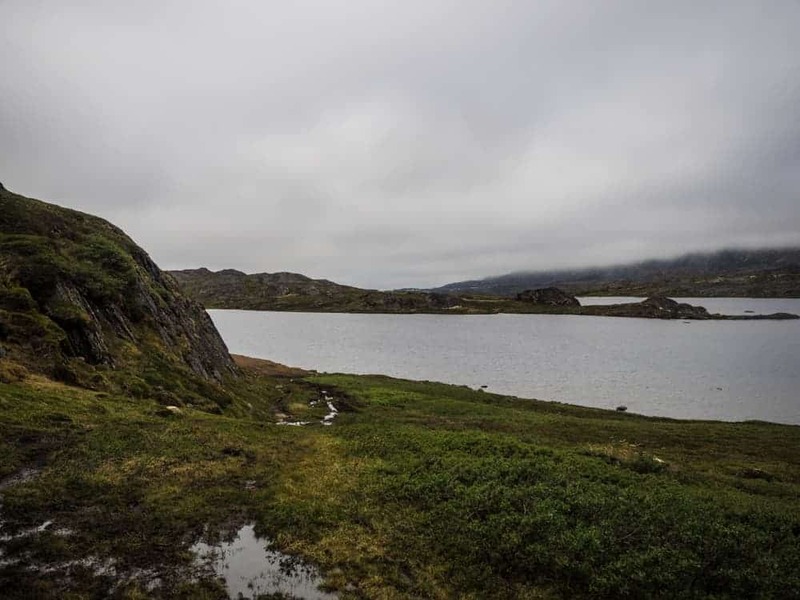 Setting off in the early morning with hope to reach Sisimiut in the early afternoon to get a well-deserved shower, but as the day ended with wet feet from the swampy/bog mud leading up to the cabin so is the day starting off like day previous day ended, with wet feet. The trail is flat in easy for the first 30minutes or so before you once again hit a wet area, It doesn’t matter my shoes are already completely soaked, so I just stubborn wonder trough it, with mud far up on my ankles. You got a big climb today that never seem to end when you think you have reached the summit, is there just another summit ahead, and another one, and then another one. But finally you reach the top and you realize that it was the very last climb you will have to do on the Arctic Circle Trail. 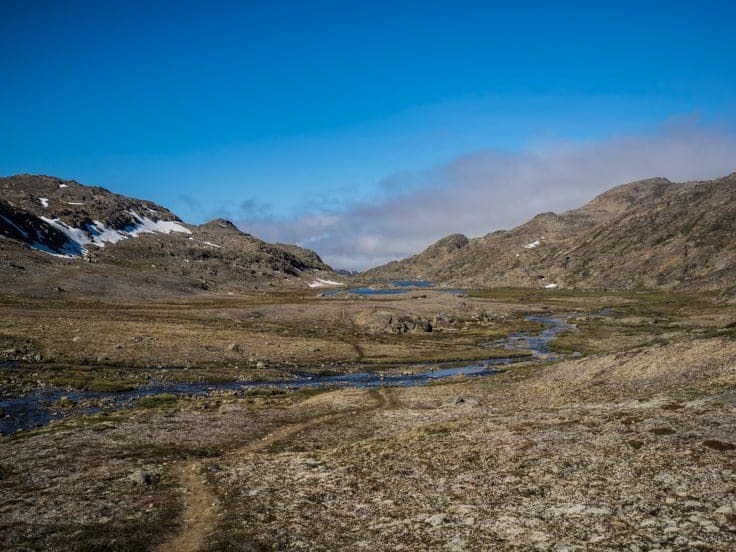 It´s not too much to say about the trail today when you reach the top is the path nice and easy through a boulder filed area before you reach a beautiful valley called Nasaasaaqso. It´s barren and rocky on the top, but beautiful. 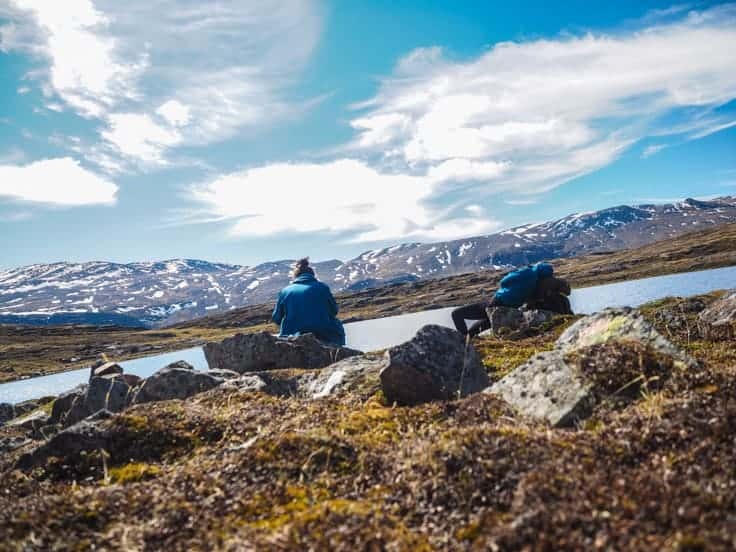 When you start your decent will you get a fantastic view over one of the most beautiful spots on the whole Arctic Circle Trail. The famous landmark at the end of the trail. and the end of the Arctic Circle Trail. It´s Done! Civilization in the far distance. From reaching the end of the trail is it about 1hour walk into Sisimut Town along gravel and tarmac road. My knees were killing me when walking on solid tarmac surface after 9days in the wilderness, but still, I couldn’t wait to get my first shower in 9 solid days and ice cold beer. 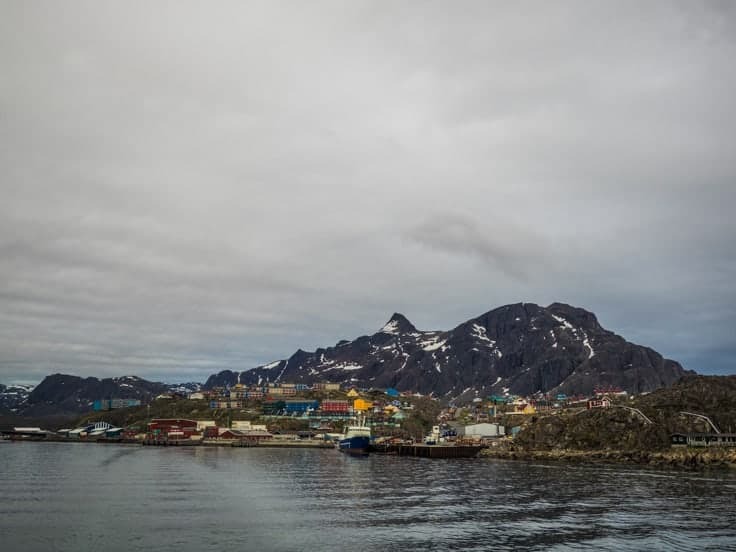 Sisimiut is Greenland second largest city after the capital Nuuk. With a population of 5570 so is it by no means a big city, even by Norwegian standards is it a small town. 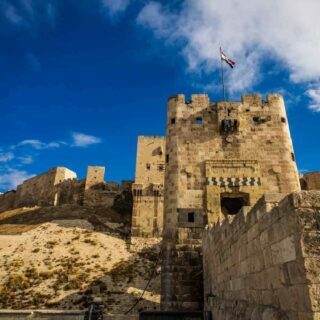 But it still got some good dining options, two well-stocked supermarkets, a bank, a cinema a few bars, 4 accommodation options, a sports shop and two cafeterias. 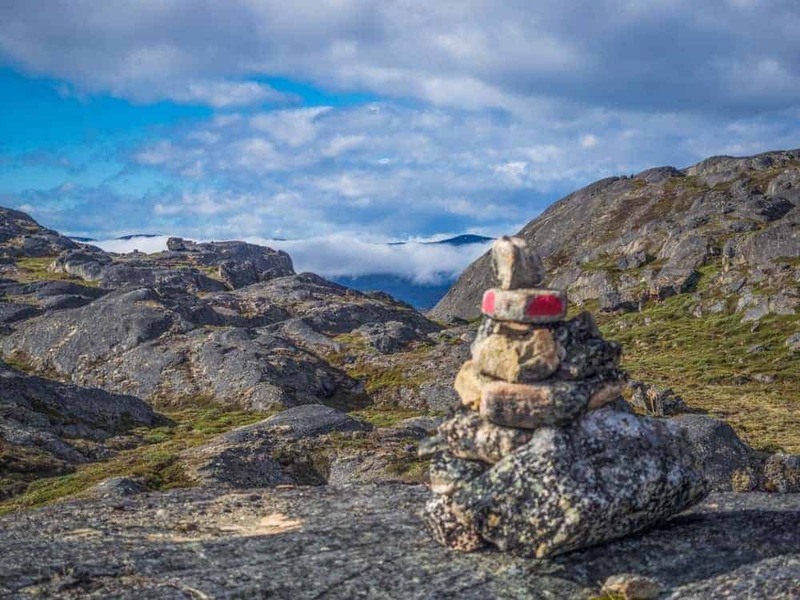 There´s not too much to do here but I can recommend you to visit the Sisimiut museum with local historical archeological artifacts and exhibitions from the region. As well as art and maritime artifacts. The culture center (Taseralik) offer the best coffee in town; there´s also the newest Hollywood blockbuster movies shown here in the cinema. The seaman house is the best place to go for lunch and dinner, but there´s also a Thai restaurant and pizza option in town. Hotel Sisimut offers buffet dinner with local food like seals, reindeer and whale meat. Like the rest of Greenland so are there no free Wifi. But all accommodation and most restaurants offer paid wifi. 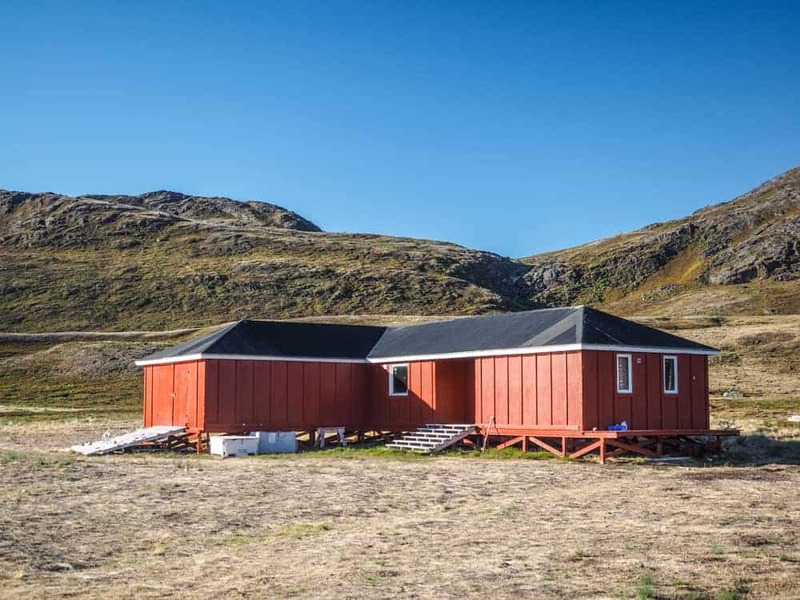 Accommodation; There are 4 accommodation options in Sisimiut. 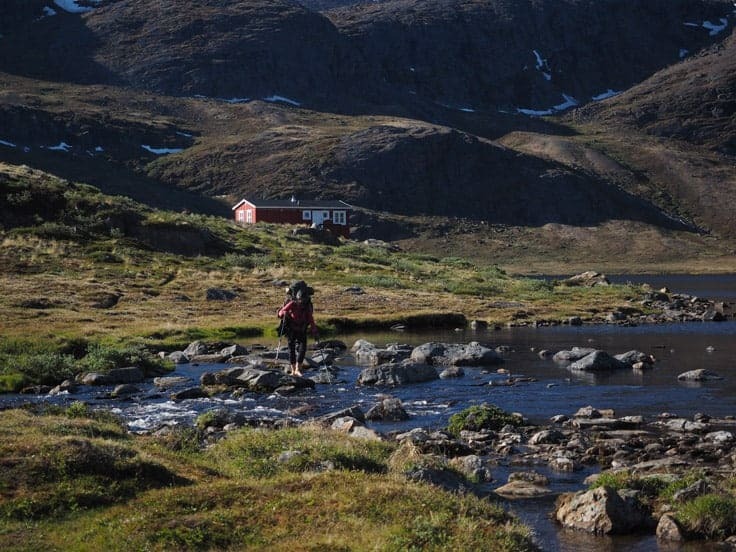 The best and most expensive is Hotel Sisimiut that is the first place you reach when entering the town after the trail. Ask for hikers deal. They had some great offers when I arrived. 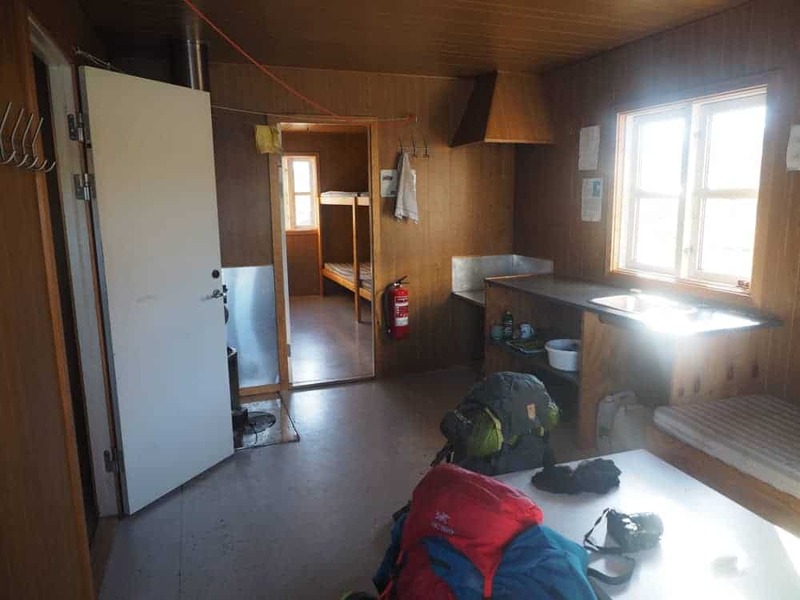 Sisimiut hostel: is the cheapest option with kitchen for shelf cooking, It´s a good place to stay, but the owner is far from friendly. 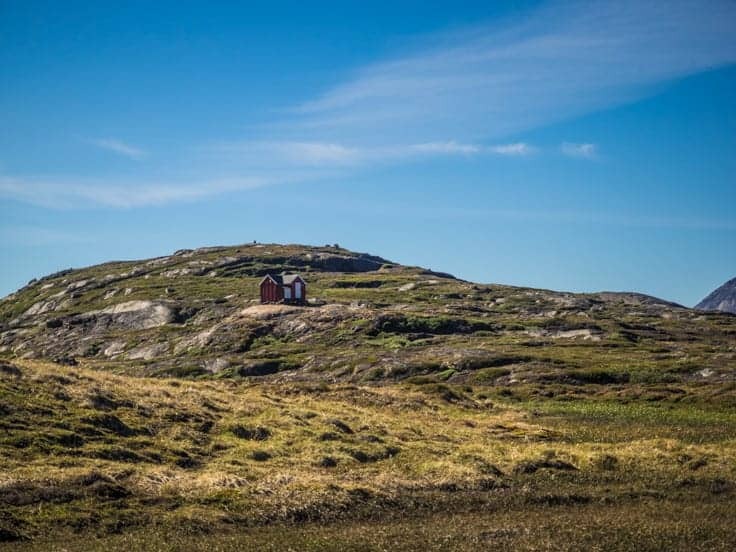 The two other options are the Seaman house and Knud Rasmussen Folks High School that turns into a hostel during the summer months. Both were fully booked during my visit. 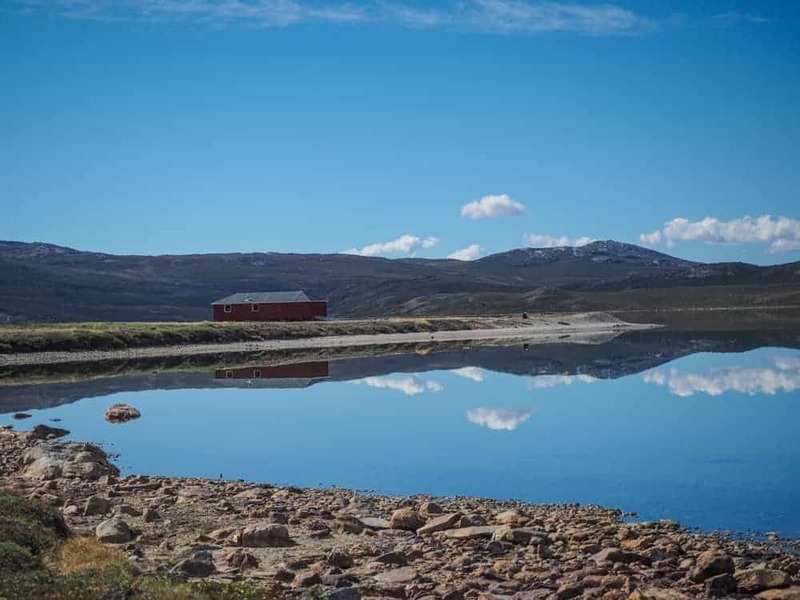 Getting There: There´s no road leading to Sisimut from anywhere else in Greenland so you got two options, domestic flights or to take the ferry the head north and south once a week. 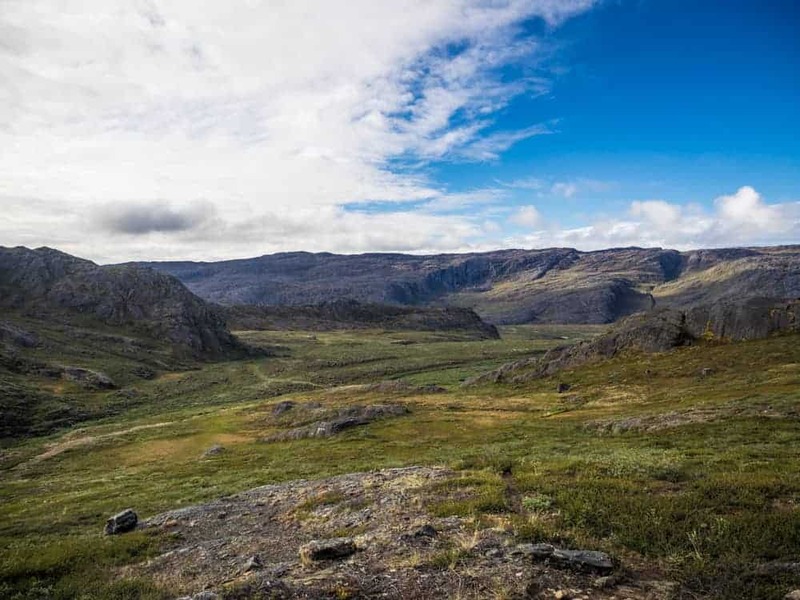 Last option is to hike back to Kangerlussuaq. 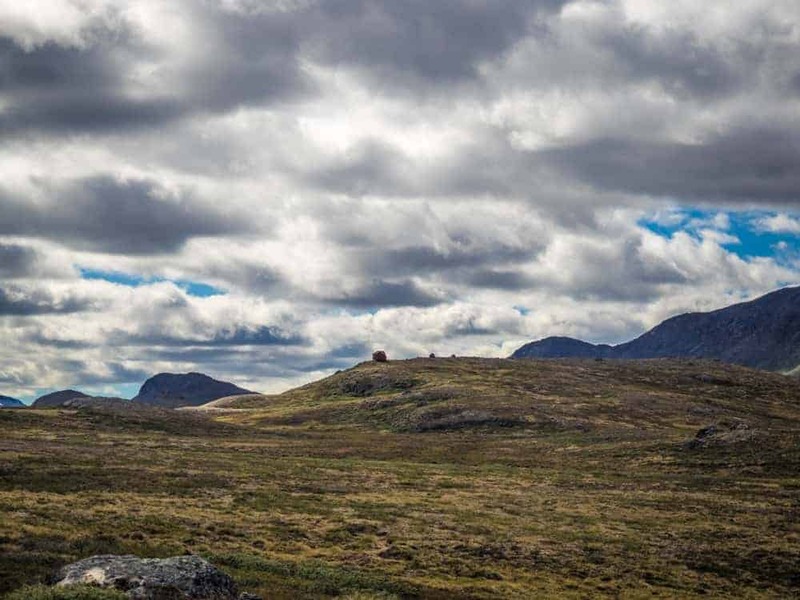 Along the Arctic Circle Trail the way you came. 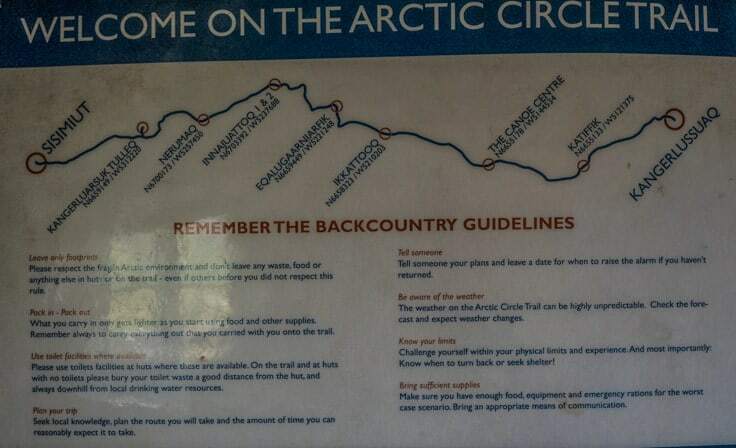 Additional Information About The Arctic Circle Trail. Is it difficult: Physically so are the hike not difficult at all. I would say it´s a very easy hike when it comes to fitness. The hard part here is the Physiological part with having to fight mosquitos and having wet feet and shoes for almost the entire hike. 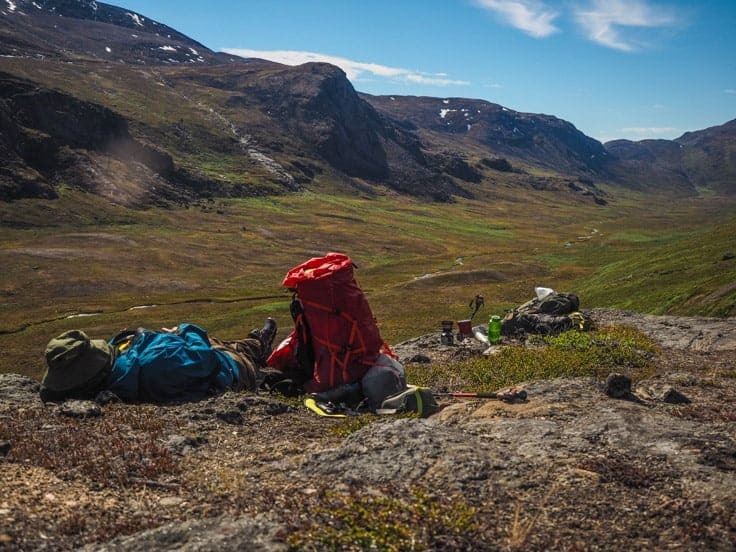 Is it dangerous: The hike is far from dangerous, but the biggest danger is if you get hurt or break a leg so are your days from the closest settlement, and you never know when other hikers will pass, so it´s recommended to hire a satellite phone in Kangerlussuaq and return it in Sisimut. 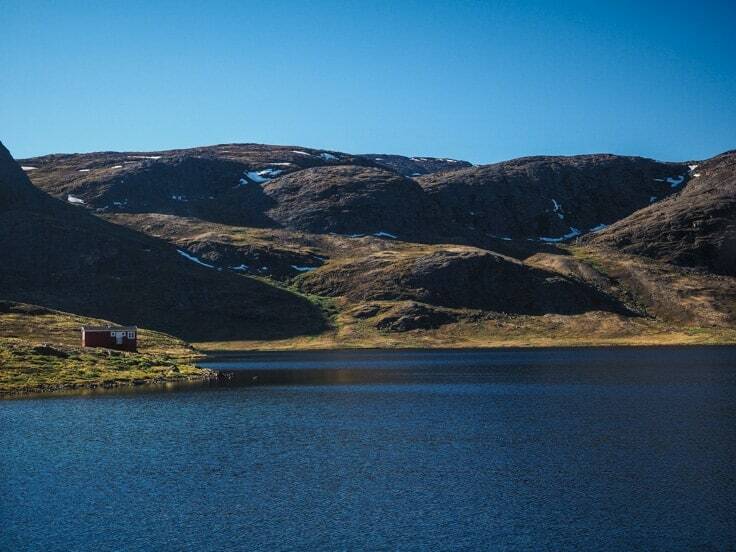 Ask your guesthouse in Kangerlussuaq or Sisimut. Can I see polar bears? No, there´s never been seen Polar Bears in the part of Greenland. Phone Signal? 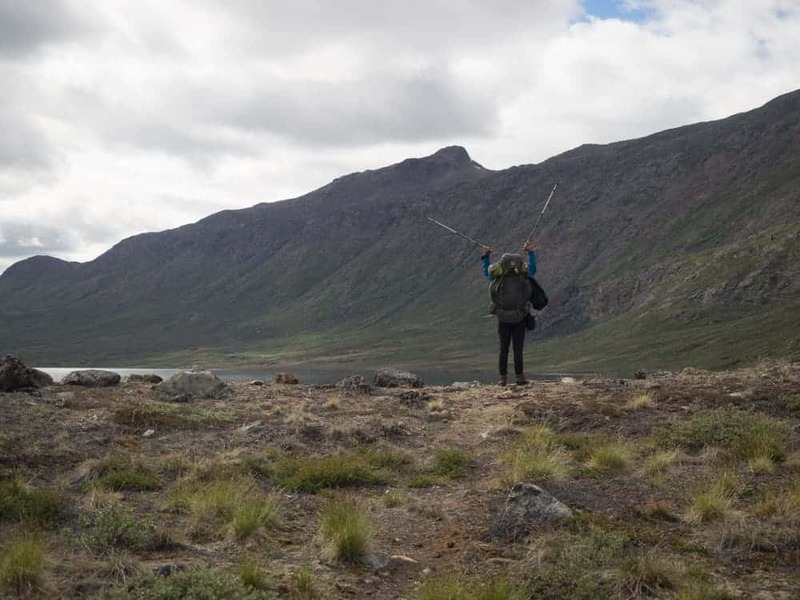 There´s absolutely no phone Signal on the entire Arctic Circle Trail. Drinking Water: All the lakes and rivers you pass are drinkable, I didn’t use any purifying tablets. What to pack? Click here to read my what I had in my backpack. Thank you for a great description of your travels. While polar bears are extremely rare in these parts of Greenland, they can occur. As you can tell by the photos even the locals where surprised to see a bear. So it’s extremely unlikely that you will see a bear, but they can occur.